In relatively recent history, we haven’t been in the UK during June. However, there was a couple of species that I was missing from my UK catalogue that really needed hunting in June and early July. These were the Northern Damselfly (Coenagrion hastulatum) and Azure Hawker (Aeshna caerulea), both limited to Scotland in our sceptred isle. So, this year I planned to remain on home turf for June/July and take a camping trip into the highlands of Scotland seeking to plug those gaps. I used the NBN Gateway to research locations for both species. Happily, I did so in the first quarter of the year before the NBN Gateway, which I thought to be an excellent tool, was retired in favour of a lesser tool [IMHO], the NBN Atlas. Why is it that other folks’ idea of progress so often seems like a retrograde step to me? Anyway, using the submitted records of more recent years, I picked three locations to use as bases. I planned to give myself three weeks in all, one week at each base, hoping that I would then have half a chance of getting at least some sun in Scotland. My somewhat extended visit was due to my very limited track record vis-a-vis Scottish weather being pretty dreadful. 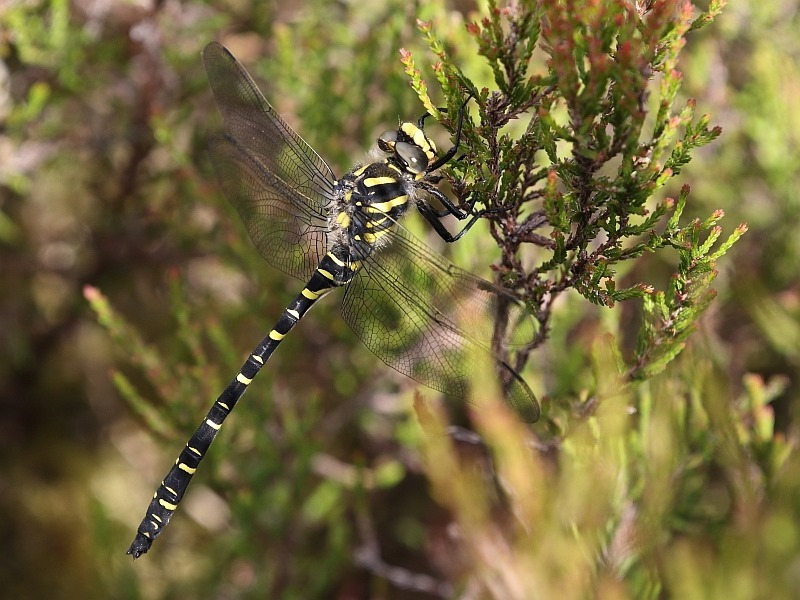 Entirely coincidentally, a friend and fellow odo-nutter, currently the Hampshire dragonfly recorder, Paul and his partner, Sue, had also planned an overlapping trip to the Loch Maree vicinity in search of the Azure Hawker (Aeshna caerulea). This was good news, we could pool information and eight eyes are better than four. The more the merrier. We arranged to hook up when they arrived. The weather was, in a word, pitiful. My track record with Scottish weather did not change; the conditions were essentially pants for the 3-week trip. During the whole time, we had one very pleasant day and one reasonable day. Outside of this, we were “treated” to just a couple of individual 1-hour windows of brightness, always in the later afternoon, while we were out odo hunting. These two 1-hour windows proved critical. 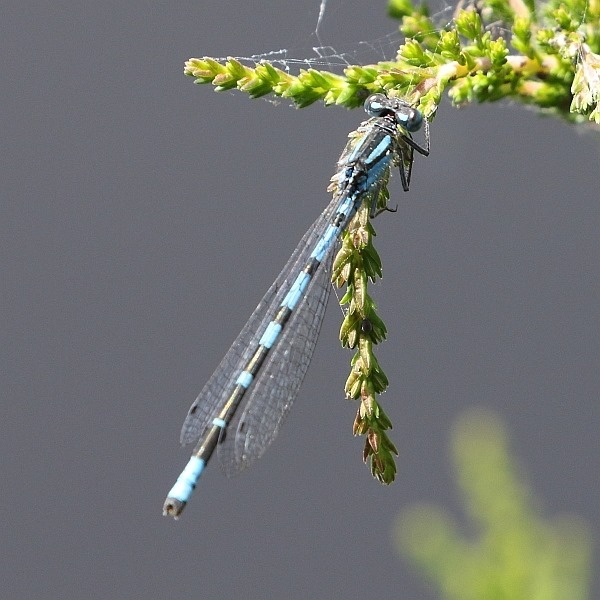 The first was on our very first full day near Loch Garten, when we succeeded in finding the Northern Damselfly/Spearhead Bluet (Coenagrion hastulatum). The second of these windows was almost two weeks later beside Loch Maree when we found the Azure Hawker (Aeshna caerulea) and this was, I’m happy to say, a particularly memorable encounter. I would consider late June and early July to be the height of dragonfly season. The largest number of species we saw at a site was five and numbers of individiuals were generally low. A poor showing, I’d say. Here’s my usual map of indexed locations worth mentioning, followed by individual details for each. Our first full day in the Aviemore region staying at the Glenmore Forest campsite beside Loch Morlich. At lunchtime we were “enjoying” 12.5°C and occasional drizzle but we decided to investigate possible locations for the Northern Damselfly (Coenagrion hastulatum). A very helpful young lady at the Loch Garten Osprey Centre reception directed us to two separate dragonfly ponds. This was the first and larger of those ponds. We first arrived mid-afternoon and found two other locals on the boardwalk. It was still cool and overcast but they’d seen some damselflies hunkered down in the horsetails, quite distant. Nonetheless, I grabbed a couple of shots. We took a tea break, whereupon conditions brightened a little. We returned between 16:00 and 17:00 to enjoy spells of sunshine and warmer conditions (16-17°C). Now there was more activity, including in cop pairs, and I found a spot where I could get closer for some decent shots. Day #1, target #1 achieved. There were a coupe of other odos here to entertain us, as well, but I was very focused. This was our good day in Scotland, weather-wise. It having brightened briefly the evening before at Loch Garten, I might have begun to think that my Scottish weather demons had left me. [I would have been very wrong.] A contact had mentioned Uath Lochans as looking “interesting” so we went to investigate. We discovered a small roadside pool with two species, both included in the list below, before taking the correct turning to the car park. On finally arriving, another visitor asked if we were looking for the Northern Damselfly. “Yes”, I replied, always prepared to see more even though we’d found it yesterday. Thus primed, I was a little taken aback staring through the lens at my first Bluet thinking, “that’s surely a Common Blue (Enallagma cyathigerum)”. And so it was, though it did look somehow different – darker. There does seem to be more black on these northern Common Blue Damselflies. 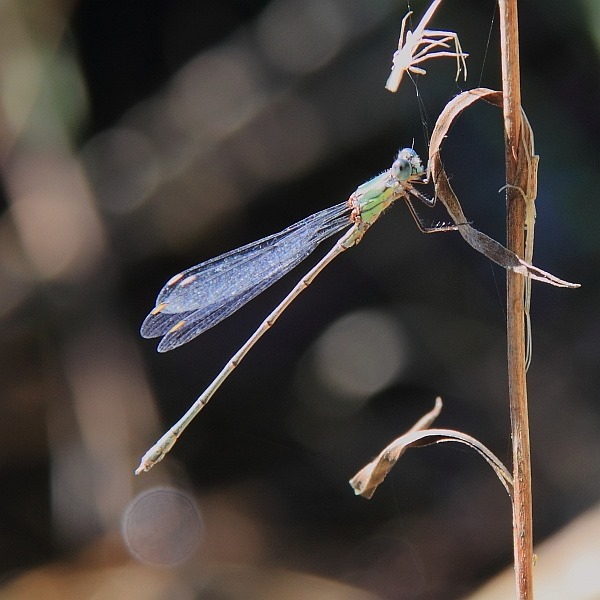 This was the only species of Bluet we saw here. Uath Lochans was a pleasant enough environment with odo-hunters being helped by Wellington boots to cope with the marshy ground at loch-side – you need to get off the main paths, which are substantial, to get close enough to the odo habitat. We wandered a decent distance but saw no more than the following, all three of which we’d seen closer to the car park. Find it we did, though. 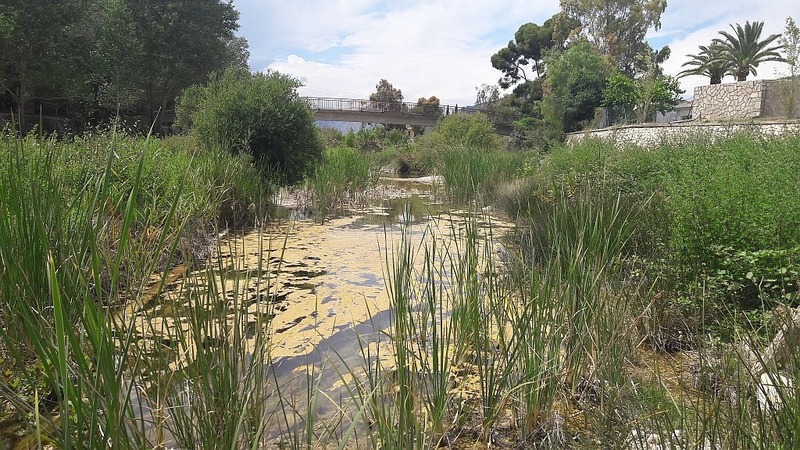 It’s actually two very small ponds separated by a very short boardwalk – more of a platform – of about 5m. As we approached, there was a little brightness. 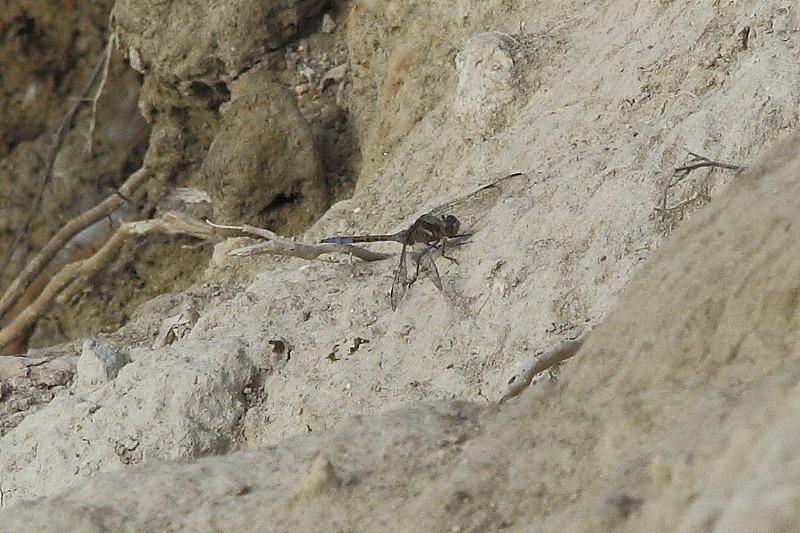 A White-faced Darter (Leucorrhinia dubia) zoomed off, as did the brightness shortly thereafter. We waited and another bright spell brought the White-faced Darters back again. That spell of brightness lasted only about 10 minutes and that was the end of the odo-hunting weather for the day. Now staying at the Inverewe Gardens campsite in Poolewe, we used an indifferent morning to wander around Inverewe Gardens itself, offering ourselves as a mobile snack to some of the the west coast midges. I found it a bit like the weather, dull. Our day brightened when Paul and Sue found us and we shared coffee and lunch. 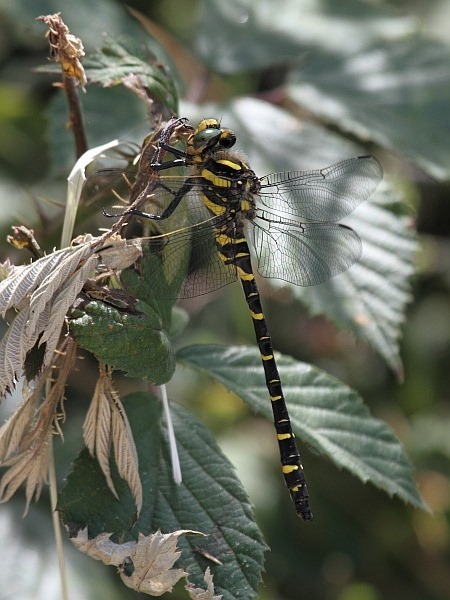 Paul and Sue had been directed by the local tourist information office to Laide Wood as being a likely odonata hunting ground. I was impressed that the tourist information included this speciality wildlife knowledge. Laide Wood is where we spent the latter half of the afternoon. It even has a car park and an information board/map. Sure enough, two ponds were shown. We took a stroll. 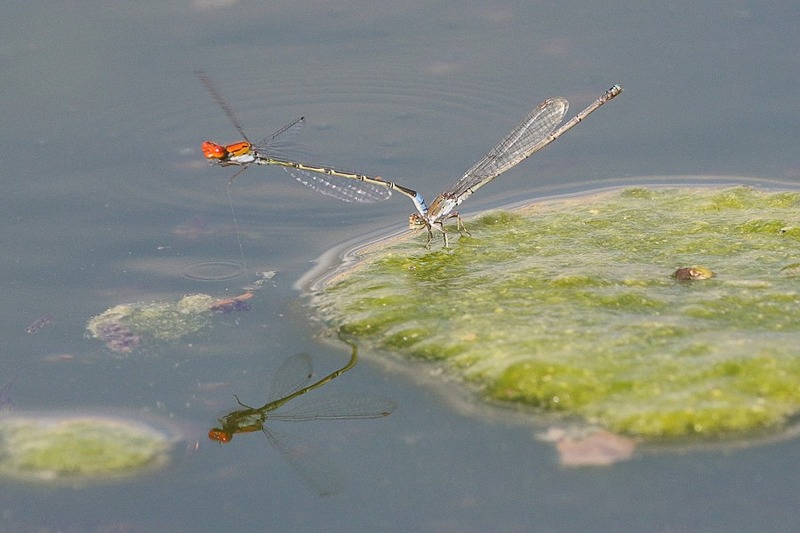 Before hitting either of the ponds we’d spotted a couple of damselflies. 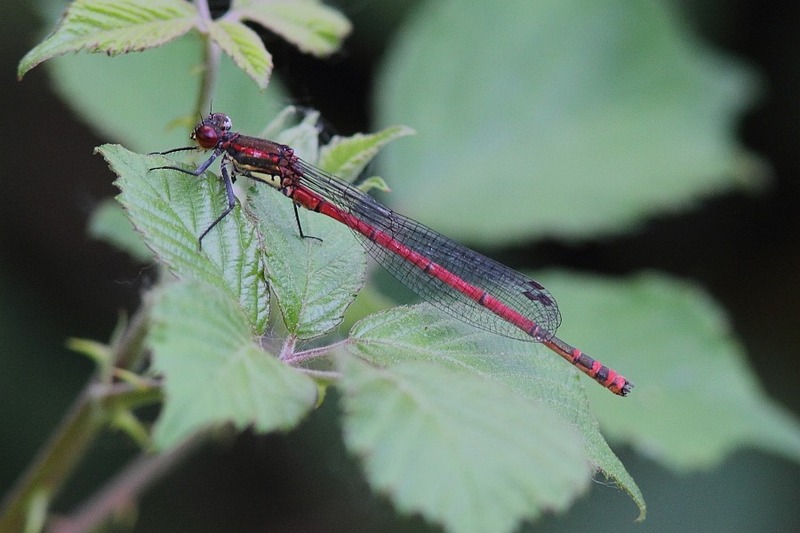 These included the ubiquitous-in-Scotland Large Red Damsel (Pyrrhosoma nymphula). 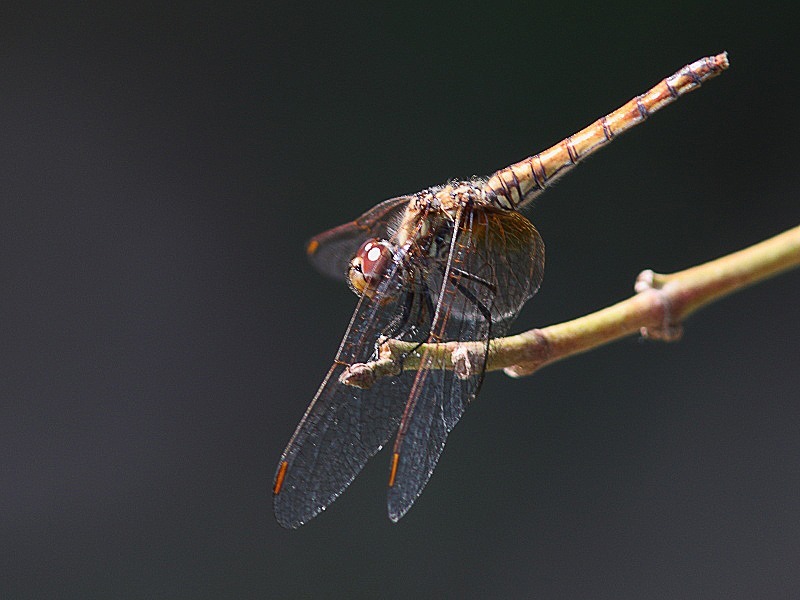 Life got more interesting, especially for Paul for whom it was new, when we stumbled across a “Highland” Darter female. These may have been shown by DNA to be a dark form Common Darter but they do look considerably different. Paul immediately noticed the lack of light stripe on the femurs. Laide Wood enjoyable habitat with good access and five species, the highest count we achieved in Scotland. Now staying at the Caravan Club’s site in Kinlochewe, we spent another half-day with Paul and Sue, who checked out a couple of sites before meeting us but drew blanks. We met them at the Beinn Eighe visitor centre, a subdued weather stroll and slight climb from which revealed a couple of subdued Large Red Damselflies (Pyrrhosoma nymphula) at a modest pond and a subdued Golden-ringed Dragonfly (Cordulegaster boltonii) sheltering from the very stiff breeze part way up the mountain. We did try another area of Beinn Eighe, the so-called woodland walk, which had suitable habitat but unsuitable weather, and that drew a total blank. Continuing from Beinn Eighe with Paul and Sue, the more western end of Loch Maree looked brighter so we headed in that direction. 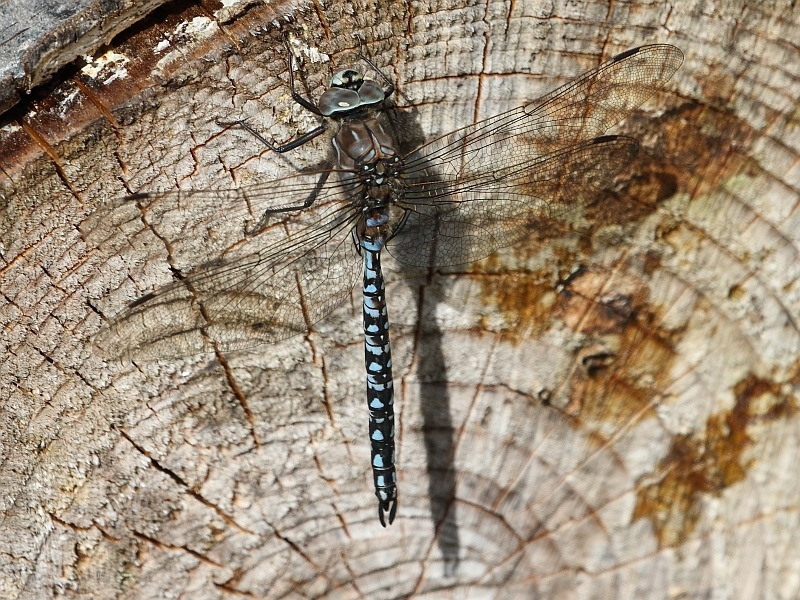 We called in to Slattadale, supposedly good for Azure Hawker (Aeshna caerulea) to see what we could find, if anything. We were also very lucky ‘cos this turned out to be our only encounter with target #2. Goal achieved despite the blasted weather. Our final move was crossing from the west coast of Scotland into the central highlands at Cannich to investigate Glen Affric, where we stayed at Cannich Woodland Camping. The helpful campsite owner directed us to Coire Loch on a walk from Dog Falls. Then I realized that Coire Loch was mentioned in the Smallshire/Swash field guide as a haunt of the Brilliant Emerald (Somatochlora arctica). It hadn’t been one of my considered targets but it would’ve been a great addition since I am yet to snag one, though I have glimpsed one very briefly at Thursley Common. It is a delightful spot and wonderful looking habitat. Here, Carol and I spent a reasonably sunny 90-minutes standing in Wellington boots beside the mossy waters edge trying to snag flying Emeralds. Eventually Carol managed a flight shot and one did settle in the heather behind her, face on but a little obscured. 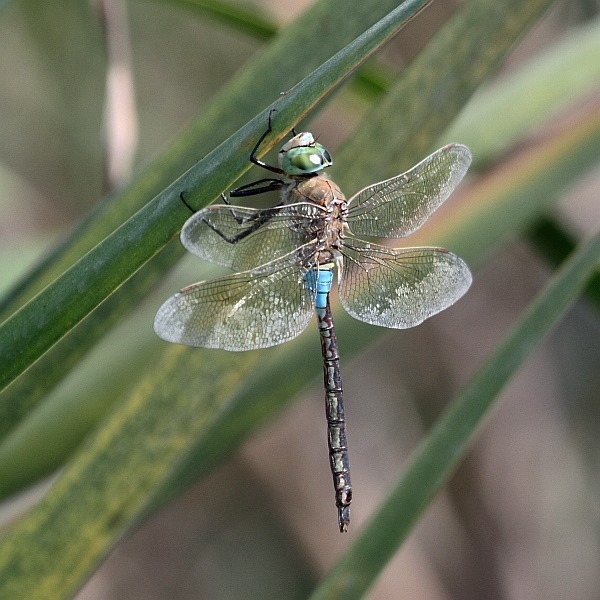 It was a Downy Emerald (Cordulia aenea). Just a little gutted since we were 500 miles from home but have a colony of Downies just 2 miles from home. No matter, it was entertaining. Travelling by slow boat (30 hours) between Portsmouth and Bilbao, this was a 6-week visit to our base in Spain at Jalón/Xaló. This being my first early season odonata hunt in Spain, I was looking forward to something fresh. I had a nagging concern, though. The 2016-17 winter in Spain, our part anyway, was a real winter. After several years of drought conditions, plenty of much needed rain fell and Jalón even had snow which settled for the first time in 30 years. Of greatest interest to me, was the Gota Fria [literally, Cold Drop] of mid-December, 2016, which we’d witnessed on our Xmas/New Year visit. Torrential rain fell and, though the town wasn’t actually flooded by the Riu Xalo-Gorgos bursting any banks, the river, normally just a few pools that hardly flow at all, turned into a raging torrent sweeping away stands of mature bamboo along with part of a road. This short video, shot by a friend, should give an idea of of why I had concerns. On arrival this time, the river had mostly returned to its normal, calm self, though it was still flowing a little more than we considered normal. These pictures are taken from within the river course itself, the river being nowhere near its banks, and the couple of fords were useable, as is usual. Examining a few stretches along the river showed that new shingle banks had appeared in places, changing the [placid] water course slightly, and a few large stone blocks that must weigh as much as a modest car had been relocated, washed off the tops of a couple of dam structures. Actually, when this happened about 10 years ago, a car was relocated downstream towards Xábia/Jávea. What would have been the effect of such a powerful flow be on any odonata larvae, I wondered? With two weeks at the end of April and three weeks in May, I had the opportunity to find out. 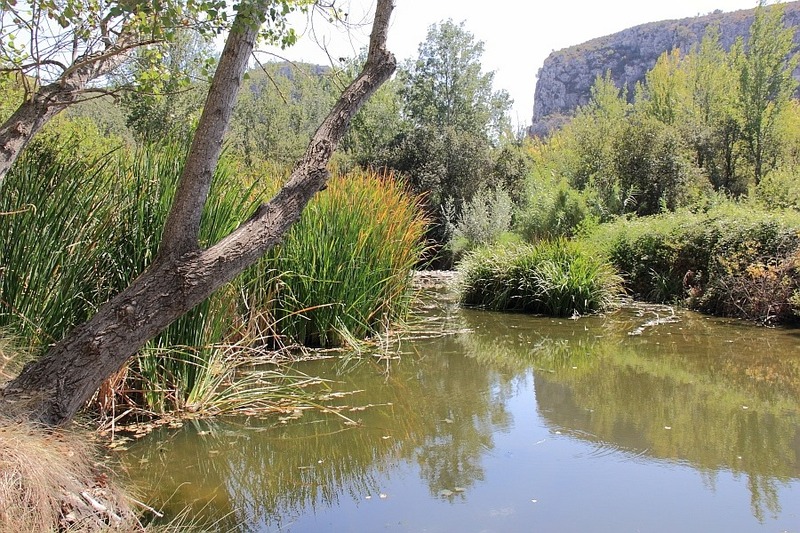 This has become the most interesting place local to our base in Spain, being a mere 20 minutes away, being a pleasant, normally quiet environment for a nature ramble and, of course, having a good spread of odonata. This time, we visited it on three separate occasions and introduced it to a friend who was also interested in photography. 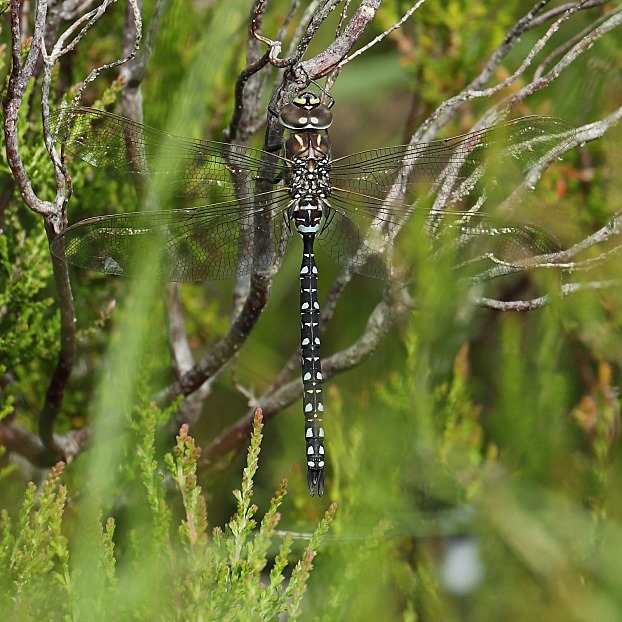 Our three visits netted us three new species for the site: Platycnemis latipes (White Featherleg), Aeshna isoceles (Green-eyed Hawker) and Gomphus pulchellus (Western Clubtail). 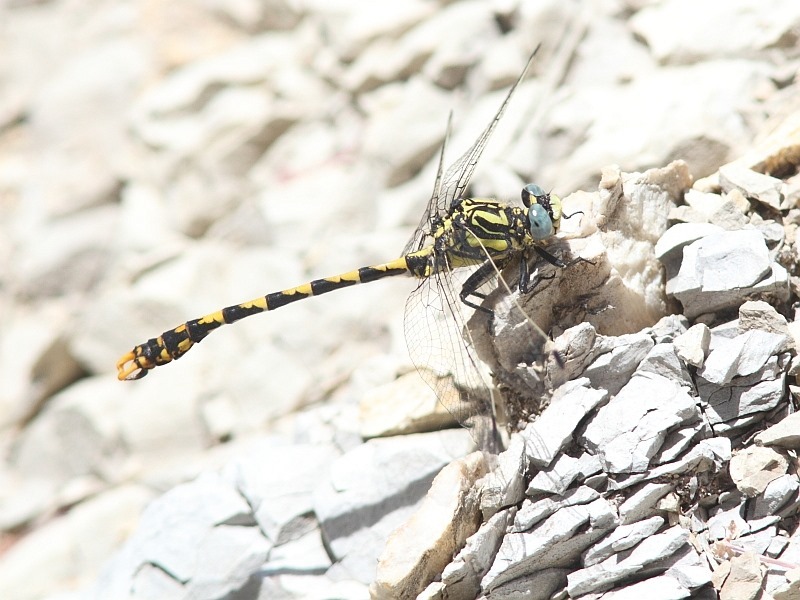 These were our first encounters in Spain of the Hawker and the Clubtail. 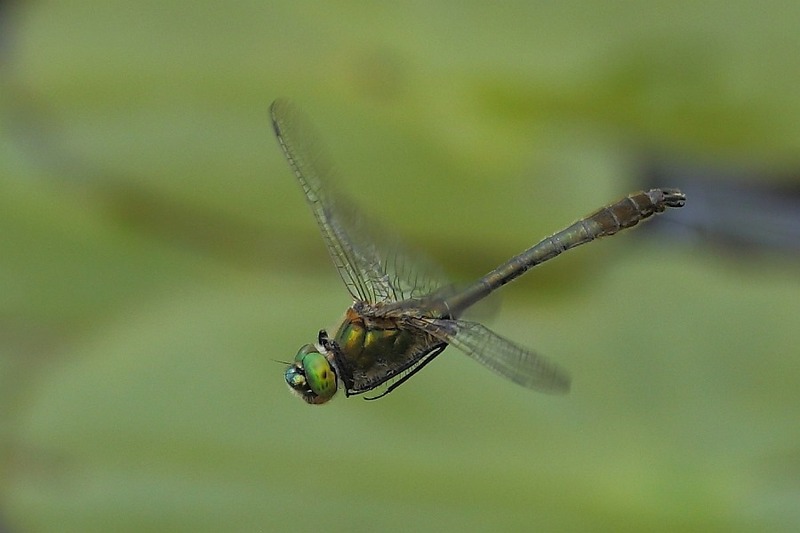 The Green-eyed Hawkers were active and quite numerous, our count reaching six. 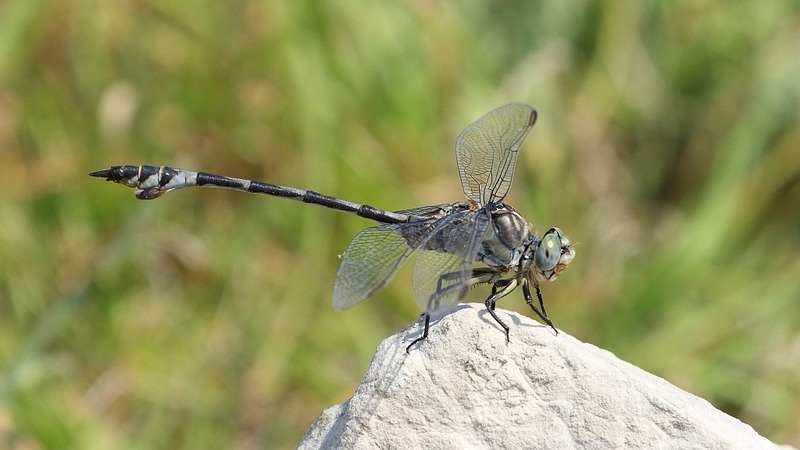 The Clubtail seemed like a lucky encounter because we saw just one and only once. 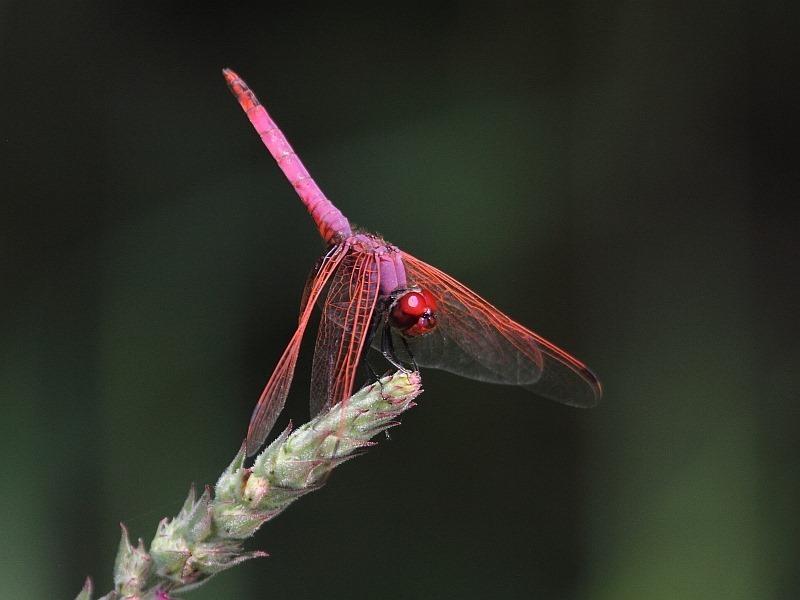 The season was just beginning, evidently, for Trithemis annulata (Violet Dropwing) and Crocothemis erythraea (Broad Scarlet), which were present in low numbers. It did present me with a beautifully fresh male Violet Dropwing, though, so different from the gaudily pink mature adult. We saw only one of the normally numerous Sympetrum fonscolombii (Red-veined Darter), too. This is what we saw this time around. 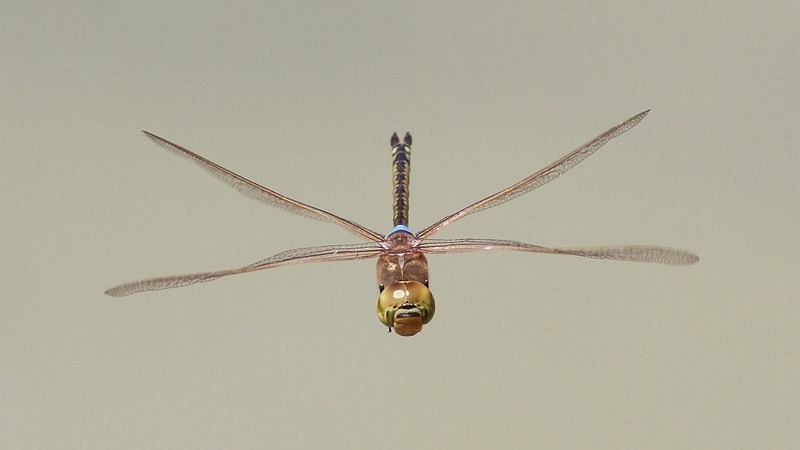 Anax parthenope (Lesser Emperor) ? This site is normally relatively peaceful. However, normally does not include an Easter weekend sunny day, even in Spain. Although it is tagged a marsh, there is a lot of grassy area for folks to set up tables and chairs. On this day, the site was absolutely heaving with large family groups picnickinhg, kicking balls around, playing badminton, etc. It did not make for good Dragonfly spotting. Around the first of the two lakes, we saw just a pair of Ischnura elegans (Common Bluetails) and, of course, several hundred Homo sapiens. I was on the point of giving up completely but thought we might as well exit with a circuit of the second lake. JUust as well; we found there some patrolling Anax imperator (Blue Emperor) and a very teneral Crocothemis erythraea (Broad Scarlet) which had clearly just emerged and had taken its first tentative flutter. On one occasion we have been allowed access to this normally closed off site. We’ve seen five species here. This time, we just wandered past on our way to lunch, not really being here for dragonflies, but did spot a single Anax imperator (Blue Emperor) as we did so. This site, new to me in August 2016, instantly became one of my favourites when I found not only Selysiothemis nigra (Black Pennant) but also, brand new to me, Bracythemis impartita (Northern Banded Groundling). ‘T was certainly too early in the season for either of those but I was keen to visit again and see what I could find at the start of the season. Our first visit was rather spoiled when Carol was descended upon by too many mosquitos for her to bear. She retired from the field of battle and left me to swiftly find what I could before driving her to safety. My main find was good numbers of patrolling, mating and ovipositing Emperors, both Anax parthenope (Lesser Emperor) and Anax ephippiger (Vagrant Emperor). Both males having a blue saddle, they are a little tricky to distinguish in flight. 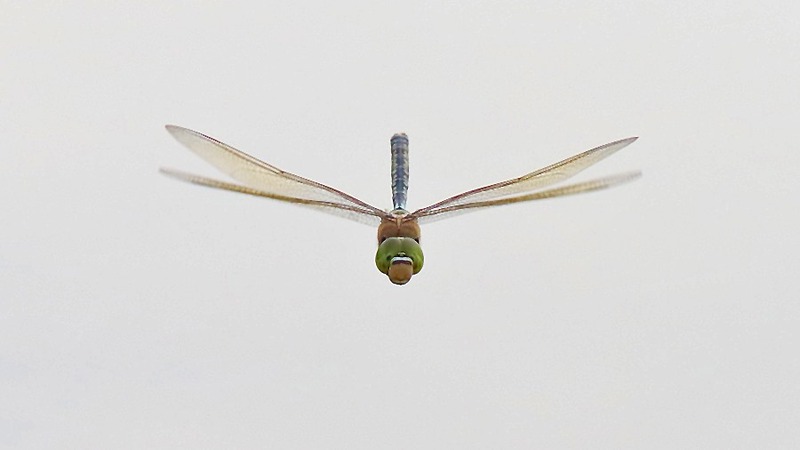 One, though netted me what I feel must be my best ever dragonfly picture, a male in flight, ahead on – the wind, which they tend to fly into, was in exactly the right direction. 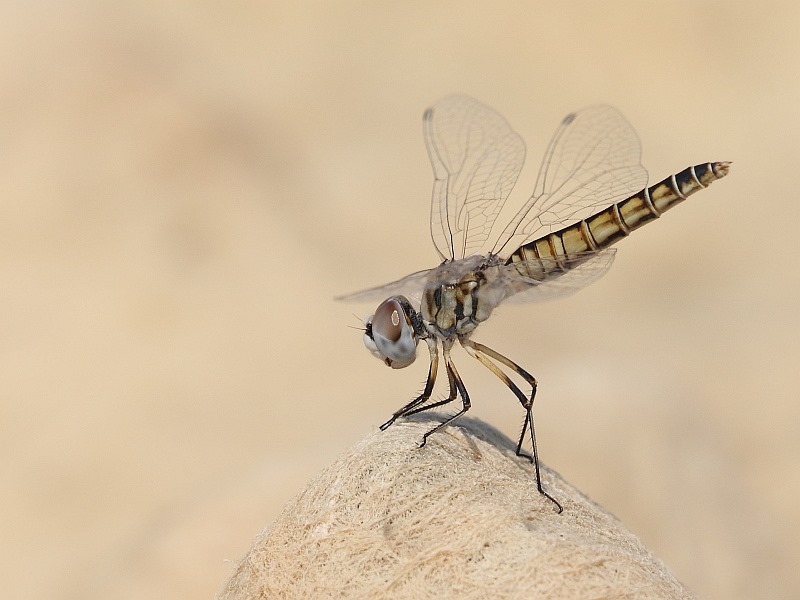 We returned for a second visit, Carol now equipped against mosquitos, and added a couple of new species for our site list: Erythromma viridulum (Small redeye) in good numbers and an emergence of Sympetrum striolatum (Common Darter) with individuals clearly rising up on their maiden flights. Hitherto, we had visited this site only once but it was in May and we saw the delightful Calopterx haemorrhoidalis (Copper Demoiselle) in good numbers. This visit was about a week earlier in the year but I was keen to see the beauties again, if possible. For me, it was not possible but Carol did see one which regrettably fluttered off before I got to it, never to return. I was surprised by the lack even of an Anax imperator (Blue Emporor), though we did once again encounter a single Onychogomphus uncatus (Large Pincertail) sunning itself on the rocks. On our way out, an immature Orthetrum chrysostigma (Epaulet Skimmer) put in a last minute appearance, which was new to us for this site. The Riu Serpis emanates from a reservoir near Planes. It was another new discovery for us in 2016. Finding water in this part of Spain for dragonfly habitats can be a challenge and run offs from reservoirs seems to be a useful tactic. Since this was a different part of the season, I was again keen to see what species we could add to our site list. Here’s the four that we did identify, which included our first Spanish encounter with Platycnemis acutipennis (Orange Featherleg) and took us up to 10 at the site; reasonable for a couple of visits, I think. It got me my sight of Copper Demoiselles, too, having missed the one Carol saw at the Fonts d’Algar [#5]. This visit also clarified the Bluetail question that prevails around here – there were also Ishnura elegans (Common Bluetail), so I’m still to find that elusive I. graellsii (Iberian Bluetail), regrettably. 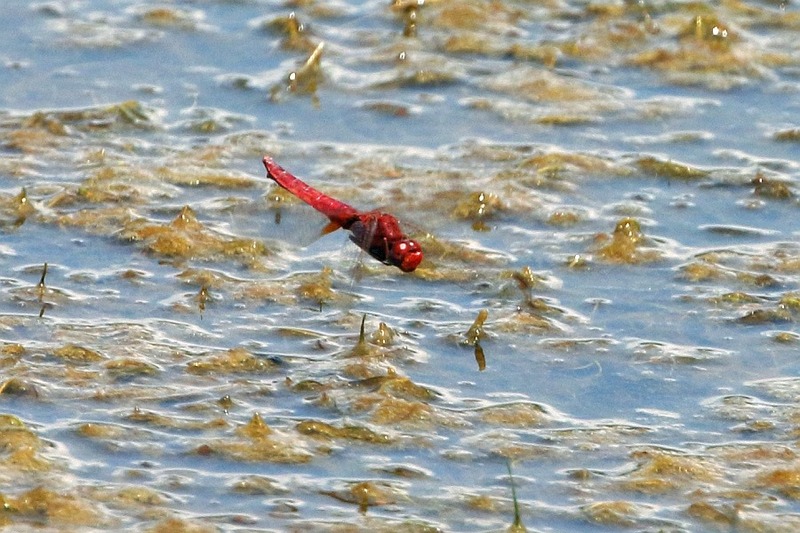 There was actually a fifth species, red darter-ish which we saw just fleetingly and failed to id. We continued along to to this second site along the same river. Here, we got a bit of a surprise. This site had clearly been hit hard by floodwaters during the winter. Here, the course of the river had changed slightly and there were gravel banks where water used to be, save for a cut off remaining pool or two. Even the parking area was now more of a gravel tip. At first we saw absolutely nothing, apart from scaring up a few Plovers clearly nesting on the stony ground; we gave them a wide berth). We did eventually find three individuals. Again, like the Fonts d’Algar story, these were three separate individuals of three species – just one representative of each. Perhaps indicatively, all three were located around the pool remaining from the original water course, now changed. Much of the ground where larvae would have been was now dry. I think this site will need some recovery time. This was an unexpected surprise. We had a trip to photograph the artistically architected buildings of the City of Arts and Sciences on the eastern side of Valencia. We knew they were surrounded by reflecting pools of water but I suspected these pools would be utterly sterile – and so they were. Behind the (on the northern edge) the buildings was a fairly pleasant park area with water but that also looked sterile. Until we got to the section beneath the road bridge, that is, a section which buts into a permanent source of water complete with reeds. To our surprise, we found this impressive list of seven species flitting about, again, not in great numbers – just one or two of each – but at least they were there. A low count (1 or 2) of a single species hardly qualifies this as an odonata site but technically it is and I’ve included it because it is notable as being our first ever encounter with this particular species in Spain, Pyrrhosoma nymphula (Large Red Damselfly). Castell de Castells is a popular walking area. We’d been up on an orchid hunt and were returning through Castell, which has a very modest stream running through it, one you can almost literally step across. Scouring the streamside vegetation in overcast conditions, we found one, possibly two (one disappeared and another appeared but could’ve been the same specimen) Large Reds. Modest but exciting because of its significance. And so to my main concern, the river flowing through Jalón itself. Bearing in mind that I had at least four weeks to observe and look for odonata here, to cut a long story short, my fears seem to be well founded. This site had been my leading Spanish site in terms of number of species witha count of 14. It had also been good in terms of numbers of individuals. Despite checking here on a regular basis during the 4-5 weeks of this stay, all we could come with as identifiable specimens were three cruising Anax imperator (Blue Emperor), a lone Sympetrum fonscolombii (Red-veined Darter ) and a lone immature Orthetrum chrysostigma (Epaulet Skimmer), this last being at our final attempt. The RVD was actually on a higher stretch of the river at Alcalalí. 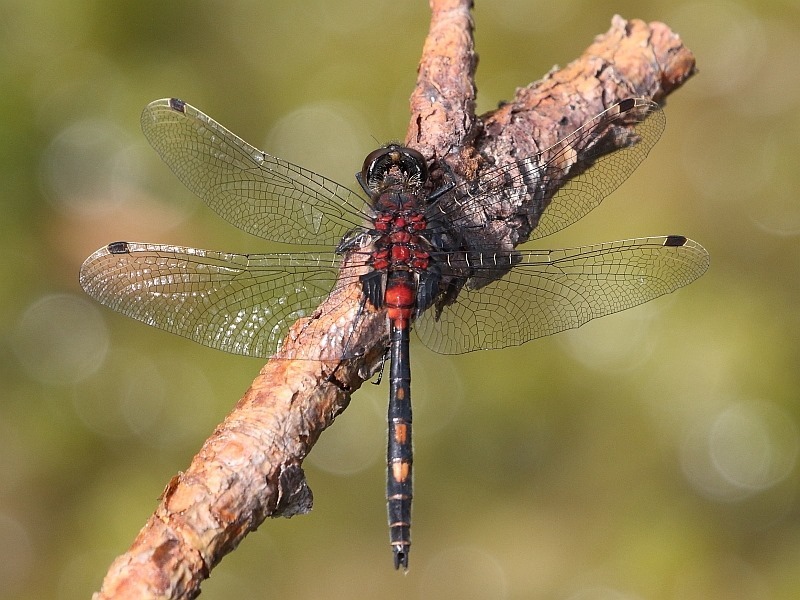 To complete the picture fairly, earlier in the trip, towards the end of April and before we hit the road to play tourist, I believe I saw a red-looking darter-sized dragonfly, possibly Crocothemis erythraea (Broad Scarlet) but it was fleeting and never seen again. Later in the trip I saw another darter-sized individual fleetingly, not red, but again it was unidentified and never seen again. So, up to 20th May, 1000 miles further south than my home base in England and in a noticeably better climate, in 5 weeks we had notched up five confirmed individuals, three of which had been Emperors. Fully formed Emperor larvae are large and strong. Is it possibly that a few of these might have survived the torrents where other lesser individuals might not have? What of lesser formed Emperor larvae? They do, after all, take a few years to develop fully. All other larvae of the species I’ve seen here are smaller and less strong. Five individuals, seven with the two uids, simply cannot be good. I honestly believe that the torrential river flow caused by the Gota Fria of December 2016 has taken its toll on the odonata population in the river at Jalón. Nature will bounce back but it’ll take a while given what we saw this time. Mercifully I can end on a brighter note. Travelling by car, we stayed for two nights at Soria a mountainous area about 3 hours south of Bilbao. Soria is at an altitude of about 2000ft. It’s apparently one of the coldest places in Spain, with 90 days of frost every year. Unbeknownst to us beforehand, it is also near the beginning of the Duero river which finally becomes the Duro and flows out into the Atlantic at Porto, Portugal. When we arrived we were delighted at what we saw, a well maintained river with well constructed and managed walkways beside it. We had originally intended to play tourist in the car but the river was irresistible and we just walked locally in fabulously clear weather. We were very glad we did. Damselflies don’t seem quite so easy to find in Spain as dragonflies but here we found four species. Not only that, but two of them were firsts for us in Spain. 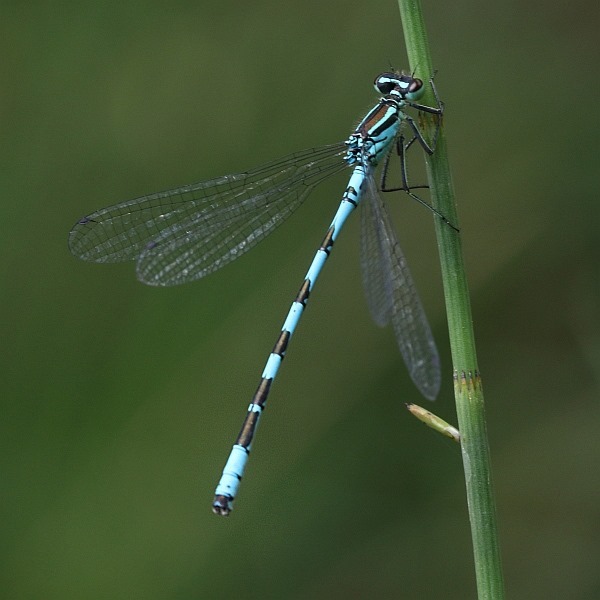 Our Spanish firsts included good ol’ Coenagrion puella (Azure Damselfly) which, on a sizeable river, was a bit of a surprise. My biggest delight, though, was Sympecma fusca (Common Winter Damselfly) which was present in large numbers along every part of the river we examined. We’d seen them before in small numbers in France but here they were teaming. I did wonder if their over-wintering as adults made them well suited to surviving those 90 days of frost but it seems they like dead/dying reeds, of which there were plenty. 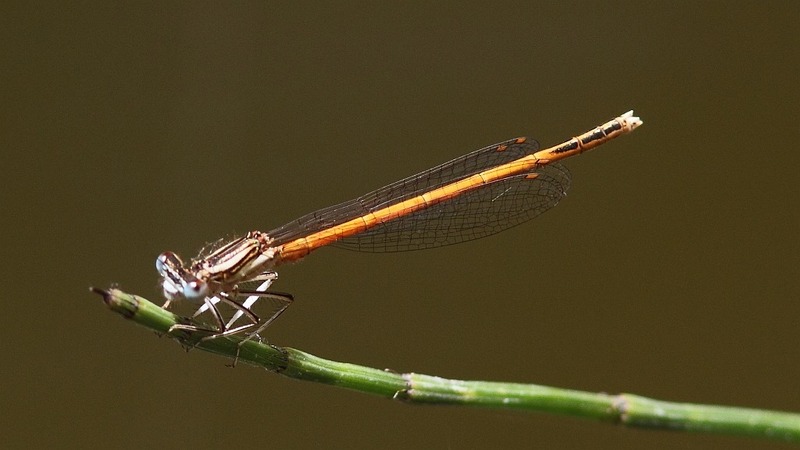 It was also only our second encounter in Spain with Pyrrhosoma nymphula (Large Red Damselfly). So, all in all, three out of four species were pretty special – a very welcome spot of success on our way home. In February 2017 we joined an Explore! safari around northern Namibia, their Namibian Lodge Safari. It was a mixture of culture and wildlife but wildlife in the form of big game. 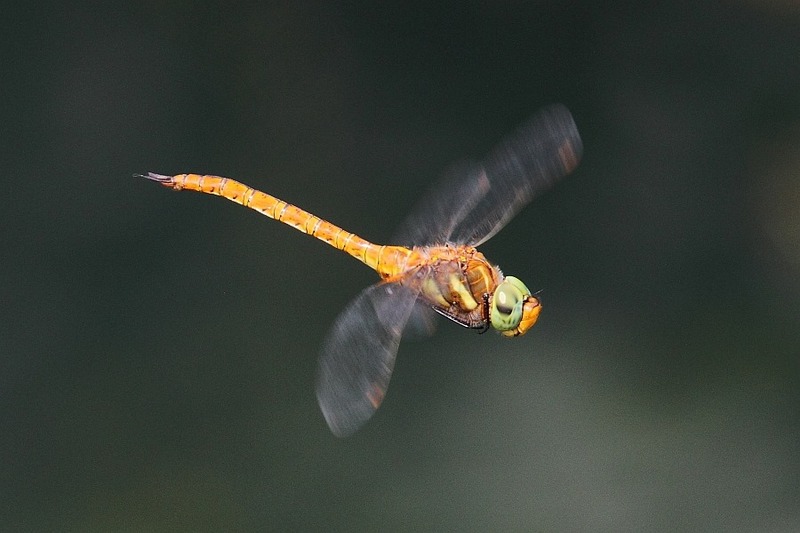 I had no control over the itinerary, which was very full-on, so what is contained below is a commentary of those dragonfly encounters which just happened along the way. This, by the way, was Namibia’s wet season and it was having a very wet wet season. There is a brief slideshow of the species we did see. Below is my usual indexed map of locations followed by details for each. 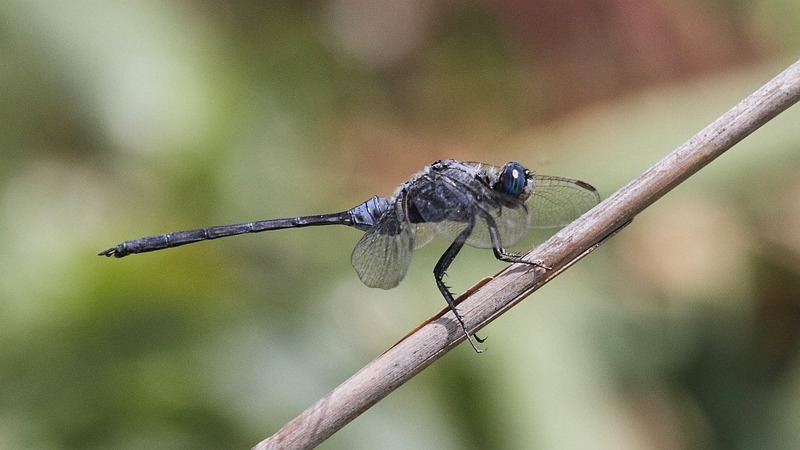 As unlikely as it seems, when we called in to a filling station in Rehoboth in preparation for losing the tarmac road and heading further west on dirt roads, there were numerous dragonflies cruising tirelessly back and forth over the station forecourt. They were difficult to see but I fancied they were largely light tan with a faint red blush on the dorsal side of the abdomen. I formed a suspicion as to what they might be but daren’t hope. They got nowhere near settling and the background was too confused for a flight shot. Frustrating! 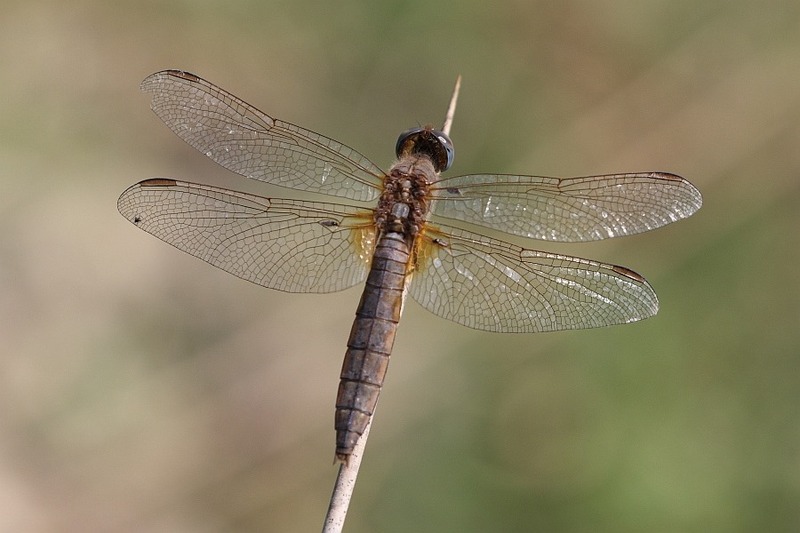 Later, I proved that they were the iconic Wandering Glider (Pantala flavescens). This was a fabulous guest house that was in the middle of nowhere, well off the beaten track. It was used to playing host to wandering zebras and was absolutely teeming with butterflies and moths, the latter of which insisted on trying to steal drinks from ones wine and/or beer. My highlight was its ornamental pond and small water hole (which also had paving around its edge). Here I encountered three dragonflies, two of which were clearly resident (I spotted exuviae) and one damselfly which I observed ovipositing. 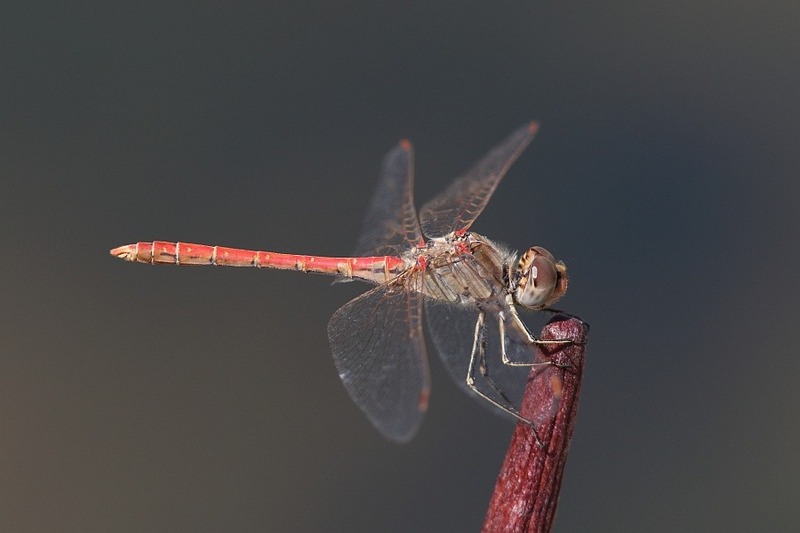 Unfortunately, the two resident dragonflies were nothing new to me, Orange-winged Dropwings (Tithemis kirbyi), spreading well in Spain, and Red-veined Darters (Sympetrum fonscolombi) breeding even in the south of the UK, now. The damselfly, Massai Sprite (Pseudagrion massaicum), was both colourful and new, so I was delighted to have encountered that. Another most unlikiely place for a single encounter with an apparently lone dragonfly. We’d stopped in the middle of the desert, just after climbing out of a gorge, and pulled in behind a green tour bus. Cruising back and forth behind and to the side of the bus, was yet another Wandering Glider (Pantala flavescens), though I still didn’t then know what it was. The really curious thing is that it vanished completely moments after the green tour bus drove off. Station forecourts, buses … what was the attraction? Yet another location where we saw a few of the constantly cruising suspects. This time, with a good deal of patience and manual focus to avoid the confused background, Carol snagged a couple of distant flight shots. Suspicions increased and did eventually prove to be Wandering Gliders (Pantala flavescens). I did catch a single glimpse of another, smaller dragonfly but, alas, it disappeared as quickly as it had appeared. “Bother!”, said Pooh, crossly. I was sick in camp (an ailment from food at our previous stop) so this one was down to my ever-vigilant missus. 🙂 Out on a day’s game drive, more in search of Elephants than Odos, at Namutoni camp during lunch she spotted a very small dragonfly perching close to the ground. It turned out to be a female of the very appropriately named Little Percher (Diplacodes deminuta). Hoorah, another new species. The Waterberg Plateau is an extensive rock plateau rising alone out of a large tract of otherwise flat, wild countryside. There’s a clue in the name: it rains quite a bit here. We arrived shortly after a downpour but now the early evening sun was out and we stepped out of our Landcruisers to be immediately greeted by another new species of dragonfly. They were sunning themselves on the red sandstone rocks strewn about the place. I got a full set: male, female and immature male. Joy! These were Small Scarlets (Crocothemis sanguinolenta). The next day we went on a walk up the Waterberg. On the way down, after the day had warmed up, dragonflies were about and we snagged a few more new species, including two Orthetrums which, in Africa, need very careful identification. With grateful thanks to K-D Dijkstra himself, I’m now very confident of these two Skimmer ids. Going full circle, we ended back where we’d begun, at the Klein Windhoek Guest House. Klein Windhoek is a suburb of Windhoek itself. Behind the guest house is a river which occasionally flows; it’s actually connected to a reservoir. At the start of our trip, I saw just birds over the river. At the end of our trip it had rained and there was more water present. This was the stop that solved my constantly-cruising-dragonfly puzzle. I observed them oviposting here, too. Banging off ~110 shots, both on manual and autofocus (I now had a clear background, I could see beyond doubt that these were indeed Wandering Gliders (Pantala flavescens). My susoicion had been born out. Unbounded joy. This time we put a lot more effort into seeking out new locations. A couple of our new sites were two different spots on the save river, the Riu Serpis. 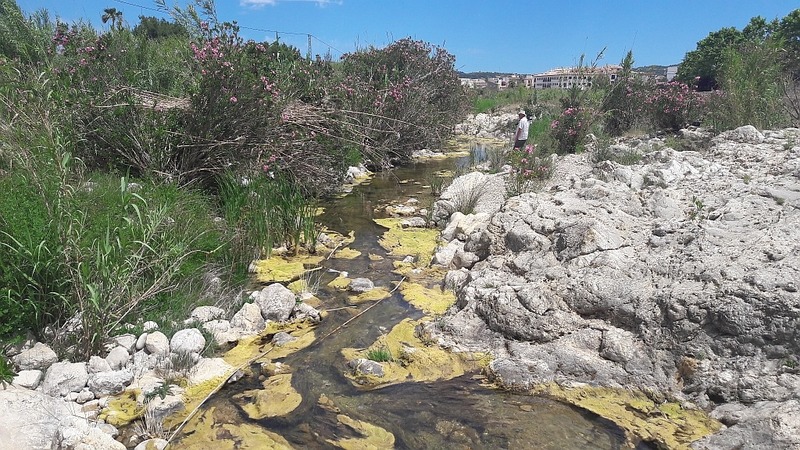 One of the more difficult tasks in Spain, certainly in the area we have chosen to make our Spanish base, is finding a river that actually has water in it. There are several rivers marked on maps near us but they are normally dry, more like a storm drain off the mountains than an actual river. Spotting what a fellow Odo-nutter had done, we tried a river that was a downstream outflow from a mountain reservoir: the Riu Serpis. A third new location had been on my “to do” list for a while; it is the Parque Natural del Hondo just south of Alicante. We really didn’t know what to expect but it worked out very well indeed. Unknown to us, Hondo provided a completely new type of habitat in the form of dried mud banks beside standing water which produced our very first encounter with a species completely new to us. Any trip that nets you a new species has to go down as a very successful trip. We had a further stroke of luck at one of our stand-by sites, the Marjal del Seniller at Moraira. 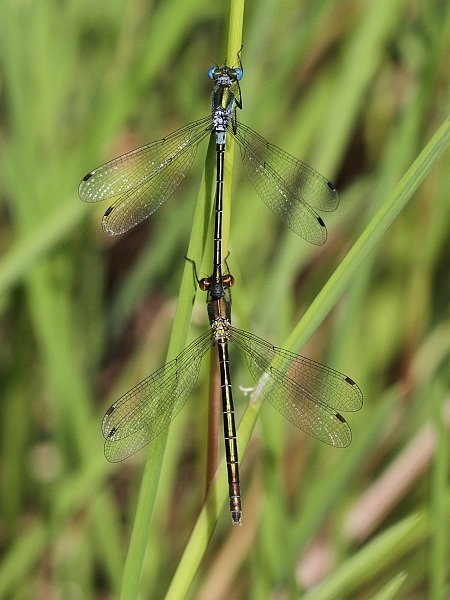 We also put a little more effort into trying to decipher the locally difficult conundrum of the local Bluetails: are they Common Bluetails (Ischnura elegans) or Iberian Bluetails (Ischnura graellsii), both, hybrids? Having the two overlapping and hybridising species makes life really difficult in this neck of the woods. I really need to be better equipped (with a decent macro lens) and to devote more effort to it. One day, perhaps. For now, they remain Ischnura sp, what I’ve come to refer to as “CoBerian” Bluetails. Spain, particularly our area of Spain (the Costa Blanca), has been suffering from a drought for about three years now. Consequently, some of my “stand-by” locations have been getting progressively less reliable when it comes to watery habitat for dragonflies. I have been plotting the river running through Jalón as a single point, though in reality there have been a few separate, but relatively close, locations along the river. I say separate because they have always been pools of water separated by dry river bed that remains dry until a storm hits. One of these pools was where I first saw a Violet Dropwing (Trithemis annulata) in Spain; another produced my first encounter with an Orange-winged Dropwing (Trithemis kirbyi). Both these pools, memorable to me, on this occasion were completely dry. The usually reliable pool near the main ford in town did have a reasonable amount of water and was still quite active, although the habitat size was a little limited and the species count was down. I was very happy, though, to see once again Orange-winged Dropwings, which are spreading very well in Spain. It also gave me my first female Epaulet Skimmer (Orthetrum chrysostigma), including as a pair in cop followed by her ovipositing. We used to park at Km5 on the CV-678, which bisects this marsh. 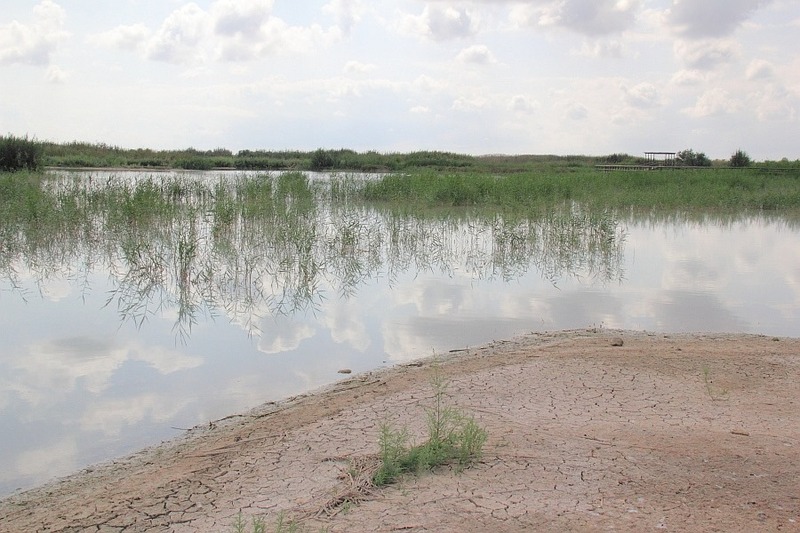 However, the water channels there had been dredged on our May visit and rice is again being grown (I think that was the original use of the marsh) so that dragonfly habitat is now rather more disturbed than I’d like. There are still some there, though. 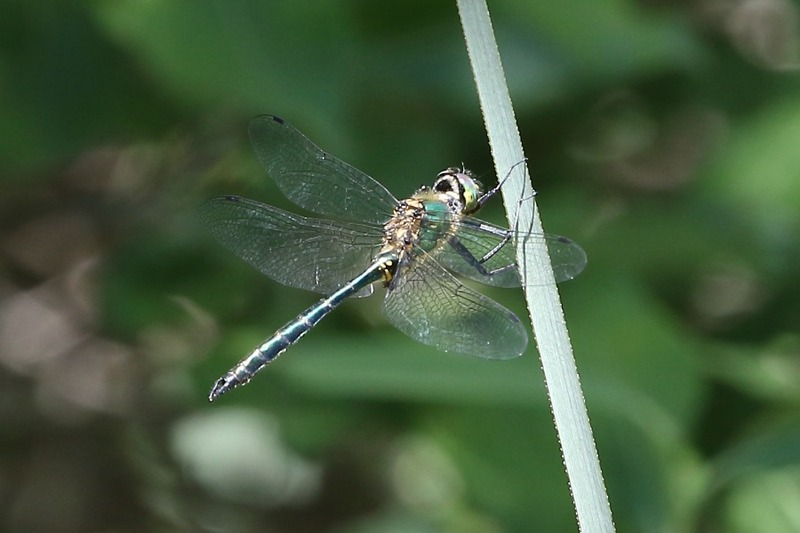 However, we followed signs to another area of the marsh, near its northernmost edge and close to the Riu Bullent, where we found a modest grassed parking area with a walking route along a water channel, which proved quite attractive to dragonflies. In hot weather it is also regrettably attractive to picnickers, bathers and dog walkers. but that’s another story – Joe Public will keep getting in the way. 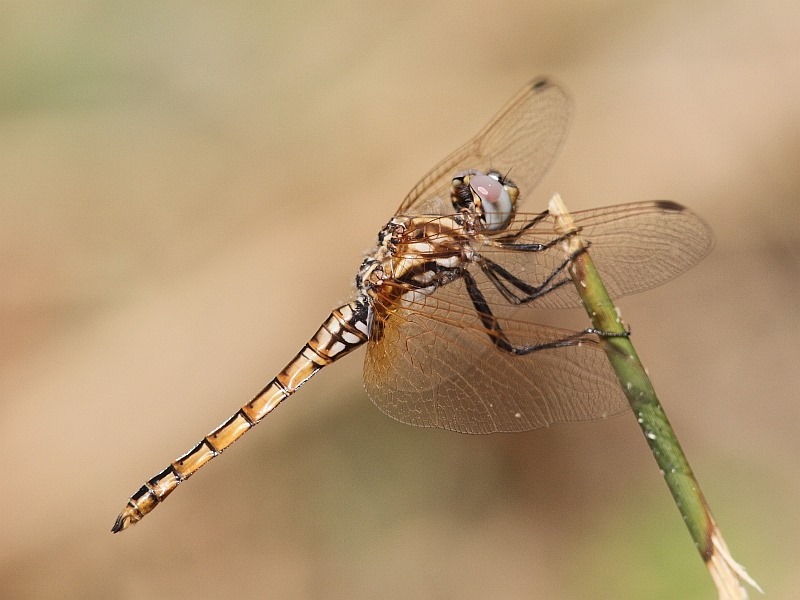 There were two stars of this visit: the always delightful, gaudily pink Violet Dropwing (Trithemis annulata) and, even more exciting because it was only my second encounter, the aggressive Long Skimmer (Orthetrum trinacria), which will feast on a Red-veined Darter (Sympetrum fonscolombii) given half a chance. This is a new area that has been on my target list for about a year, ever since I learned of it from an e-contact who was just getting into dragonflies and needed some help with identifications. He has a place in Alicante and his photos were taken at the Parque Natural del Hondo. Somewhat confusingly, in doing my research, I began coming cross commentaries talking about the P. N. del Fondo. I was initially confused but then discovered that Fondo is the Valenciana term for the same place. In an area of Spain complicated by there being two different languages in use, the names vary both on the Internet and on maps but don’t worry, Hondo/Fondo is the same place in different tongues. I have also seen comments about access to Hondo/Fondo potentially being difficult, where timing is concerned – gates locked, etc. Certainly we found a northern entrance, which was barred, but there was good parking at the point I’ve marked on the map, presumably the southern entrance, complete with a boardwalk to get you, or bird-watchers, at least, over some of the marshy areas. There was another notable species here. 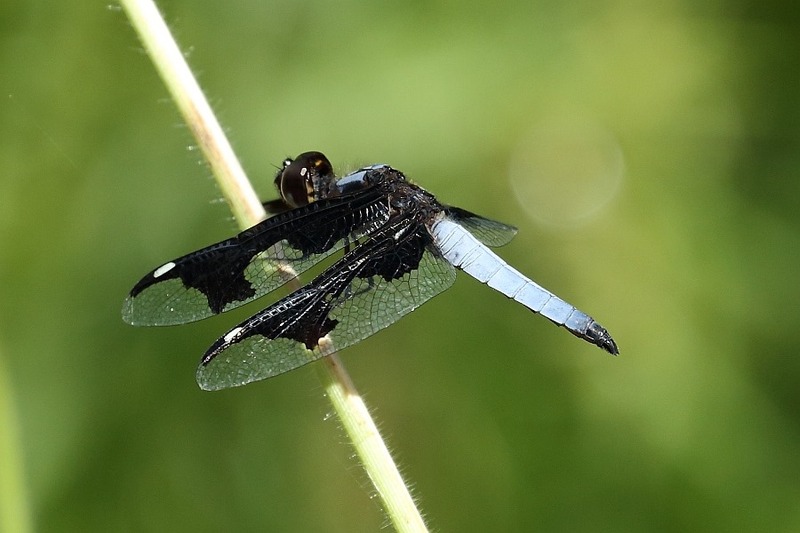 Earlier in the year, in Croatia I’d had my first meeting with a Black Pennant (Selysiothemis nigra) and here, I found it for the first time in Spain. Unfortunately, on both occasions I found only females so I’m still looking for the elusive males. I will have to return here to look harder, and to try the boardwalk area, which we did not get to on this occasion. No trip to our part of Spain would be complete without a visit to see the Greater Flamingos on Las Salinas, Common/Black-winged Stilts, too, if you’re lucky. I was. For several years all I ever saw here in the Odonata line was the ubiquitous Red-veined Darter (Sympetrum fonscolonmbii). Then, in September last year I spotted a Lesser Emperor (Anax parthenope) zooming about so my species count went up to a staggering 2. On this trip, I was very surprised to spot three additions to that list giving a slightly more respectable 5 species in total. My surprise stems form the fact that I’m still not sure about the salinity of the water, which I think varies considerably, and it’s effect on species. Certainly, RVDs have a reputation for being coastal and perhaps tolerate more salinity than others. That and the fact that, for several years, I only ever saw those RVDs. Maybe the water quality is changing. The Flamingos still like it though. Another modestly sized habitat that is close enough for regular monitoring but which, hitherto, has proved very difficult to monitor. It is a small fenced off lagoon, very close to Moraira’s main beach but without public access. Consequently, all previous observations of ours have been made from outside the perimeter fence so are necessary limited. We were dong our normal perimeter walk again this time when a man commented on our cameras and asked if we were looking for birds. We told him our particular quarry was dragonflies but that we couldn’t see far into the area and [articular not to its central watery domain. He worked with volunteers that maintain the environment and offered to let us in. We bit his arm off, naturally. Now we could identify the small shapes we could see zooming about in what had always previously been the middle distance. 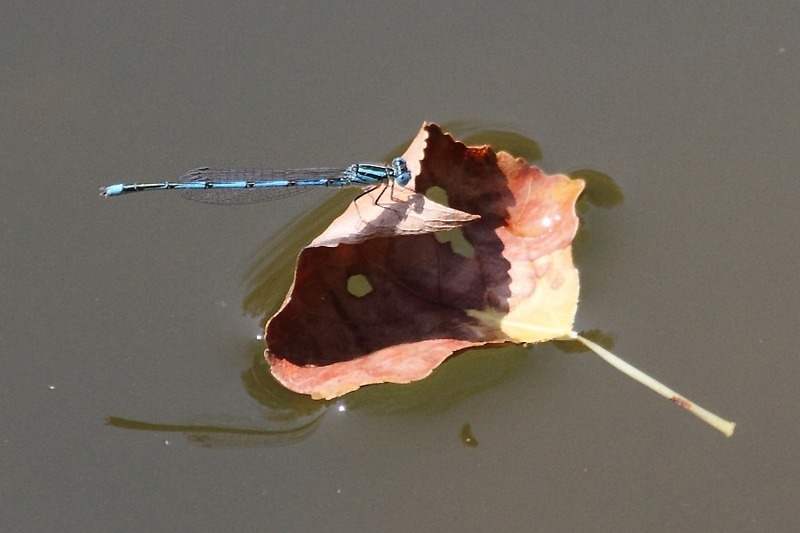 Here were two species of Emperor, Blue Emperor (Anax imparator) and Lesser Emperor (Anax parthenope), both of which cooperated by hanging up for photographs. This was our first attempt at locating useful habitat by following the course of a river that emanates from a barraged reservoir, in the hope that it might actually have some water in it in the summer. Finding water in Spain can be tricky. Our chosen river was the Riu Serpis below the reservoir at Beniarrés. Distances away from the coast in Spain can be deceptive because of circumnavigating the intervening mountain peaks. This didn’t look far on the map but because it is two valleys away, the road distance to get there is more than might be expected. It was a little more than an hour away. Having arrived at the reservoir, we began by heading east from Beniarrés along the road which more or less follows the river, both river and road running down the same valley. Shortly, we came a cross a sign beside the road pointing to a Zona Recreativa, which seemed worth a try, and so it was. The recreation area was only about 100m off the road and we found it blissfully deserted. There were picnic tables with a little shade for lunch, after which we went and found the banks of the river, which looks delightful habitat. The one slight downside is that you are facing south, into a strong sun, so photography can be awkward against the light. 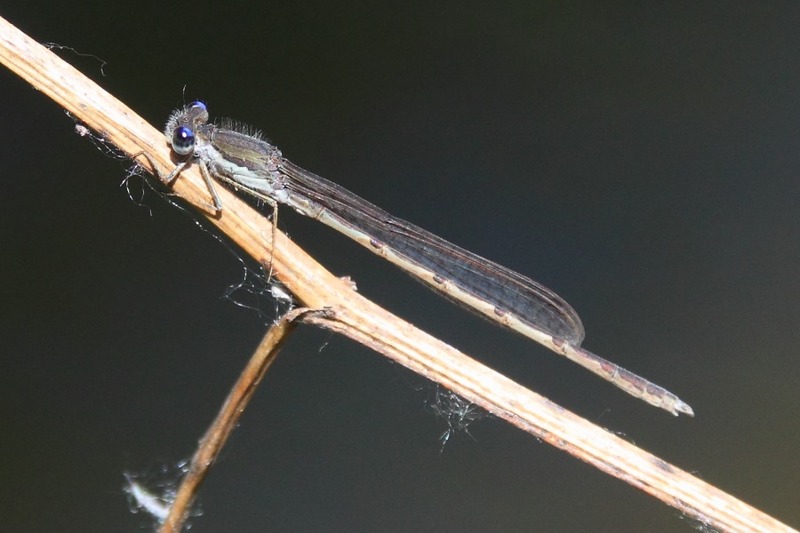 However, we found 8 species including 5 species of damselfly, which, in my experience, seem to be less easy to find in Spain, for some reason. This is definitely worth another visit earlier in the season to try and add to the species count. 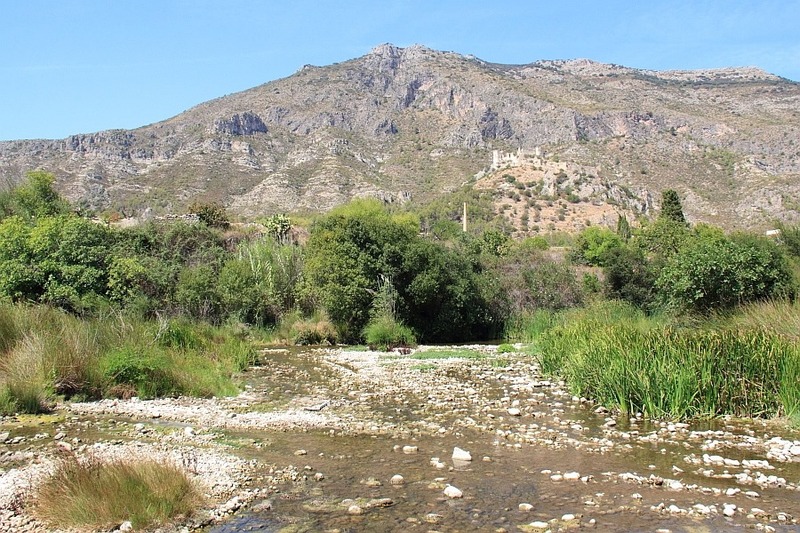 5 kms further along the valley from Beniarres is L’Orcha, also on the banks of the Riu Serpis. Studying Google Earth had revealed another parking and recreation area along a track just out of town. We combed the area on one side of the main bridge but time did not allow us to find a way over to the other side of the bridge, where we had seen suspects flying about. We’ll leave that for another visit because it certainly looks worth it. Again, it would be interesting to see what a visit earlier in the season might produce. Worthy of note on this occasion were the always captivating Copper Demoiselles (Calopteryx haemorrhoidalis) and Southern Skimmers (Orthetrum brunneum). From 25th June, on the morning following our disastrous referendum [nailing colours firmly to the mast], to 2nd July, we joined a group of friends on a mixed wildlife tour organized by Ecotours visiting Slovenia and neighbouring Croatia, I was looking forward to doing something completely different and seeing two new countries. Our group, 10 in all, was made up of a mixed bag of interests including birds, butterflies, reptiles and plants as well as, of course, ourselves seeking dragonflies and damselflies. Being a mixed tour, we were due to visit a variety of habitats only some of which would be odo-friendly, so it was never going to be dragonfly intensive but I was cautiously optimistic. Once travel days were excluded, we had three days in Slovenia followed by three more in Croatia. To summarize, we found Slovenia to be a delightful country – quite similar in feel to Austria, I thought, but then it was part of the Austro-Hungarian empire – but, while it seemed less interesting touristically, it was Croatia that made the trip worthwhile in relation to our previous Odonata experiences. Against all odds with my camera GPS failing, I’ve managed to locate the main sites of interest and plotted them on one of my (hopefully) familiar maps. We began our trip by spending our first three nights at a very pleasant hotel about 15 minutes walk from the shores of picturesque Lake Bohinj. Day #1 of the wildlife watching itself began around the shores of Lake Bohinj, which is a large lake with little in the way of emergent vegetation, so I wasn’t expecting much. I got excited when we spotted a Darter perched on some lakeside vegetation and our guide suggested it might be a Vagrant Darter/Moustached Darter (Sympetrum vulgatum), which I have yet to see, but, alas, it proved to be a familiar old friend, a Red-veined Darter (Sympetrum fonscolombii). 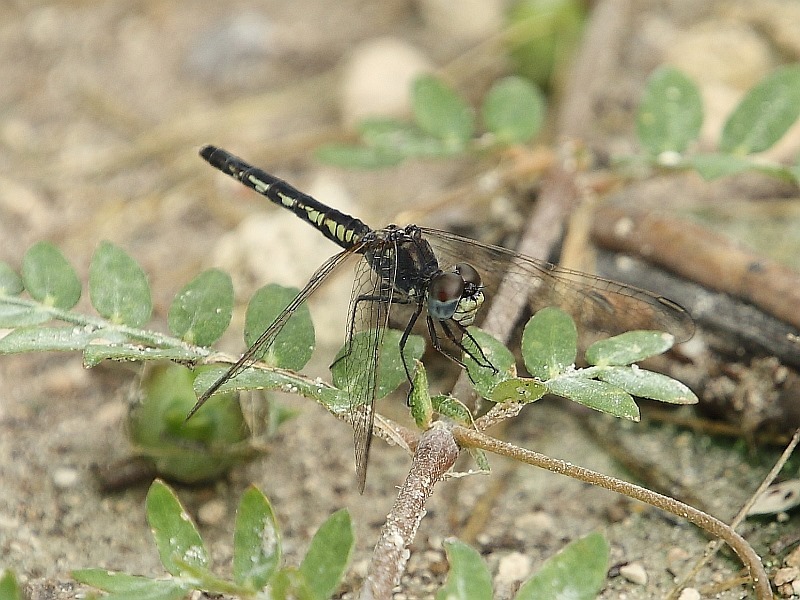 The lakeside track produced several Blue Featherlegs/While-legged Damselflies (Platycnemis pennipes), which cooperated well enough, and several individuals of what was clearly an Emerald Dragonfly, none of which cooperated in the slightest. These were clearly green so probably not a Downy Emerald (Cordulia aenea) but rather one of the Somatochlora species. 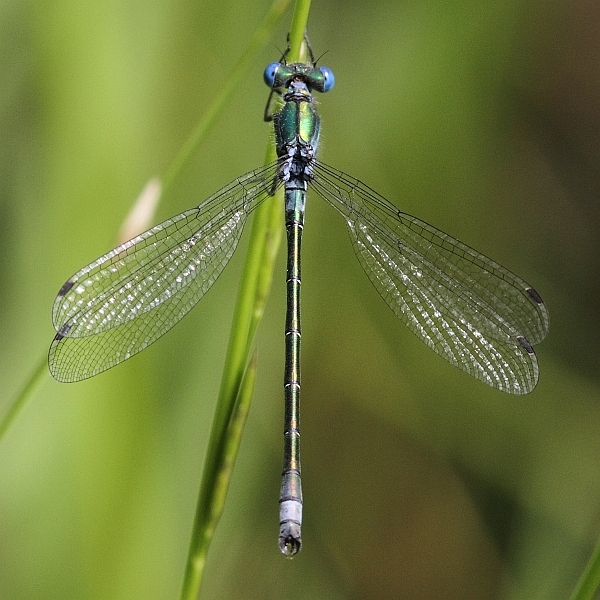 Given the habitat and behaviour, I’m inclined towards the Brilliant Emerald (S. metallica). Or Cerkniško Jezero, in Slovene, is a karst lake “characterized by underground drainage systems with sinkholes and caves”. So there! It is a seasonal lake but we found plenty of water. This may be because there was still quite a bit of water in the sky, too. the Though there are supposedly some 30 species of Odonata recorded here, our first visit was accompanied by poor weather conditions and we found only four. Fortunately, the following day was much improved and our guide was professionally flexible, reacting to his audience’s desires when he could, and we made a brief return visit to get our species count up to a more respectable 11. 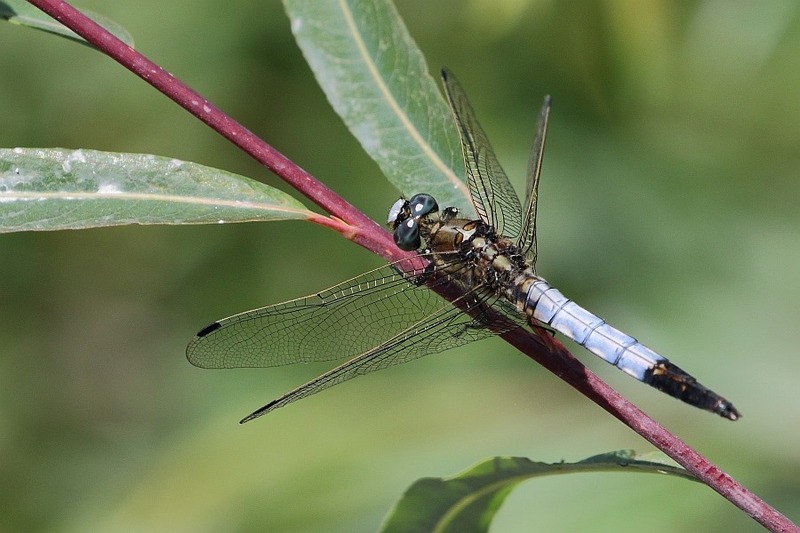 These included our first non-UK species, a White-tailed Skimmer (Orthetrum abistylum), together with other notables such as a Green-eyed Hawker/Norfolk Hawker (Aeshna isoceles) and a tandem pair of Lesser Emperors (Anax parhenope). Or Plitvička Jezera, as they say locally, was “declared a National Park in 1949”. Unfortunately, that meant it was now a honey pot that was absolutely heaving with thousands of people. Our guide, who was contracted by Ecotours to take us there as part of the itinerary, admitted that it would not have been his choice. It is really a much more touristy destination with scenic lakes and waterfalls than it is a wildlife destination. Most visitors’ idea of wildlife here stopped at Mallard duck. The area is highly developed with vast stretches of boardwalk complete with electric boat rides and road train transportation to get the swarming people around the extensive area. Not our idea of fun and we suggested it would be better removed from the itinerary in future. Having said that, given all that crystal clear fresh water, there were damselflies and dragonflies present in good numbers, though, with the hundreds of pairs of feet constantly tromping past you on the boardwalk, photographing them well was a constant challenge. I have to say that I’m glad I went there, though, because it snagged me a great new prize in the form of my very first Balkan Emerald (Somatochlora meridionalis). Not only was it there, but it was perched, as well. Incredible! 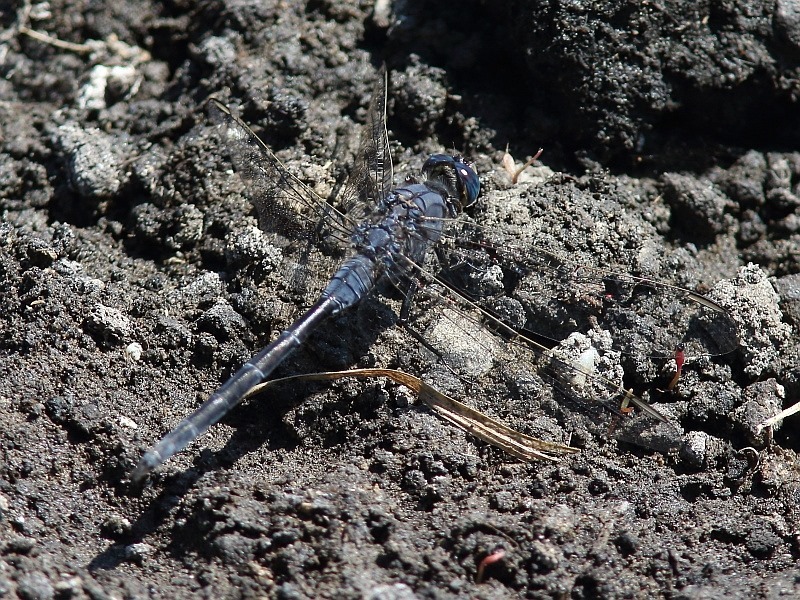 The other species of note here was the Small Pincertail (Onychogomphus forcipatus). Paklenica is a mountain park accessed via a canyon and is more of a birding and reptile venue, when it comes to wildlife. Actually, it seems to be mainly a rock climbing venue. It was a very pleasant walk, too. I wouldn’t normally have bothered to include it here but on the way back down we did stop by the river that flows out of the canyon and found a couple of Southern Skimmers (Orthetrum brunneum), so it was worth a line or two. 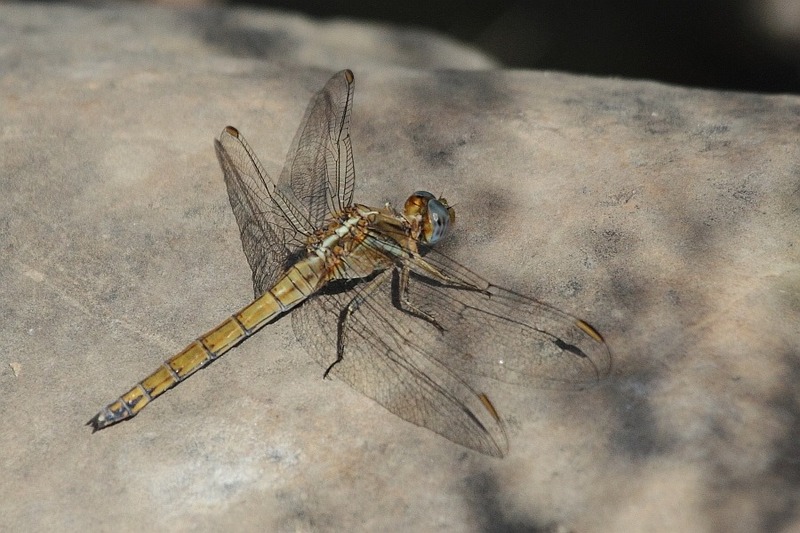 Actually, on the way up the canyon, we had a brief glimpse of a large dragonfly, which was probably a Goldenring cruising above the river but, there being two kinds here (C. boltonii and C. bidentata), sans photograph we don’t know which it might have been. So, just one confirmed sighting. On our final day of wildlife hunting, we crossed onto Pag Island, a long, thin strip of land close to the Croatian coast. It proved to be quite rocky and all but tree free, other than some impressively ancient olive trees. A first stop at some meadows with fresh water netted us two damselfly species but the first stop of any significance was at Jezero Velo Blato, which seems to translate as Lake Big Mud. Lake Big Mud is an apt description and the big mud in question was overlooked by a bird hide. On the track down towards the mud I briefly saw a large Odo but soon lost it in the confusion of tall grass stems and dry stone wall joints. As others headed to the hide, Carol and I started skirting the mud. A board advertised the presence of Black Pennants (Selysiothemis nigra), which would be a new species for me, so I was on high alert. It was while we were looking for these that what was probably the biggest prize appeared. A large, grey-ish dragon settled on the ground and posed. This was what I glimpsed but lost on the way in. It was a wonderful male Bladetail (Lindenia tetraphyla). Soon afterwards we added our second prize of a Black Pennant, though only the female of the species. 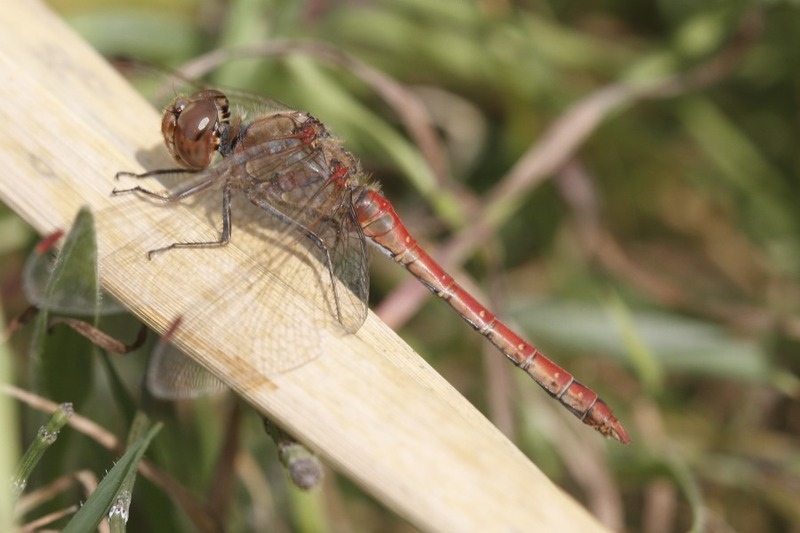 The other noteworthy find here was an elderly olive-form female Broad Scarlet/Scarlet Darter (Crocothemis erythraea). Despite a modest species count, with two exciting lifers, Lake Big Mud was the star of the trip. We weren’t quite done yet after Lake Big Mud; we made a further stop at a small lake beside the road for lunch. This little place was buzzing with activity, particularly with Broad Scarlets/Scarlet Darters (Crocothemis erythraea) but also, less excitingly being one of the home team, with Black-tailed Skimmers (Orthetrum cancellatum). Once again, the other instance being Jezero Velo Blato, we saw a very interesting female colour form Broad Scarlet, an androchrome bright red female. This was definitely not intended as an Odo hunting trip. This was a planned escape from the desperately depressing, unadulterated commercialism of a British Christmas. I went, however, suspecting that I might find a late darter or two basking in the early winter rays of the Jalón sun because I’d seen some there in December on a previous year. I hoped so, because I wanted to get a definitive identification which was hitherto missing. I was more surprised by my other find. So, albeit with very limited late-season content, here’s a brief report. There is the so-called Marjal del Senillar [marjal = marsh] on the coast at Moraira and I do mean on the coast – it is quite literally on the other side of the boardwalk from the beach. 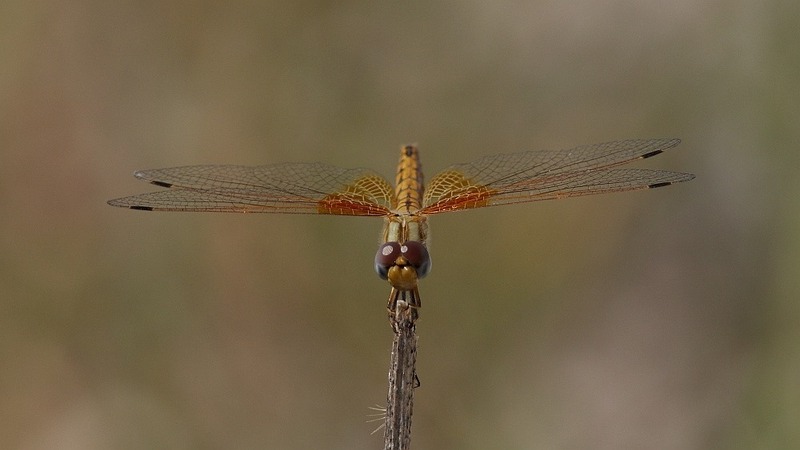 We had seen a late Odo there, a Common Darter (Sympetrum striolatum) a few years ago but, because I had failed to find anything else since, I never added the marjal to my Spanish locations map. 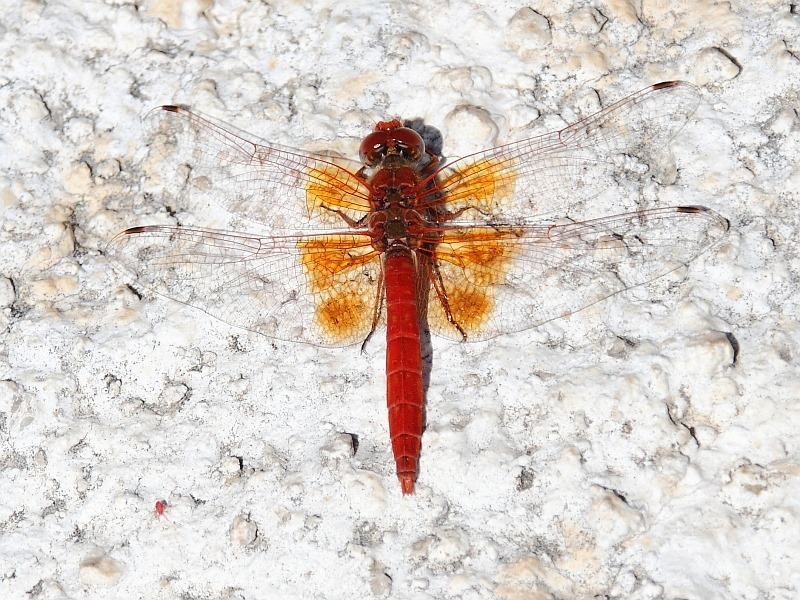 Since then, we added a Red-veined Darter (Sympetrum fonscolombii) to give us a list of two. This year, we visited Moraira just after Christmas Day and, not expecting any dragonfly encounters, were poorly equipped photographically. However, Carol did have her full frame camera (so no 1.6X APC sensor advantage) armed with her 24-105mm general walkabout lens. Just as well she had something because, to my complete surprise, an Odo flitted about to begin sunbathing. 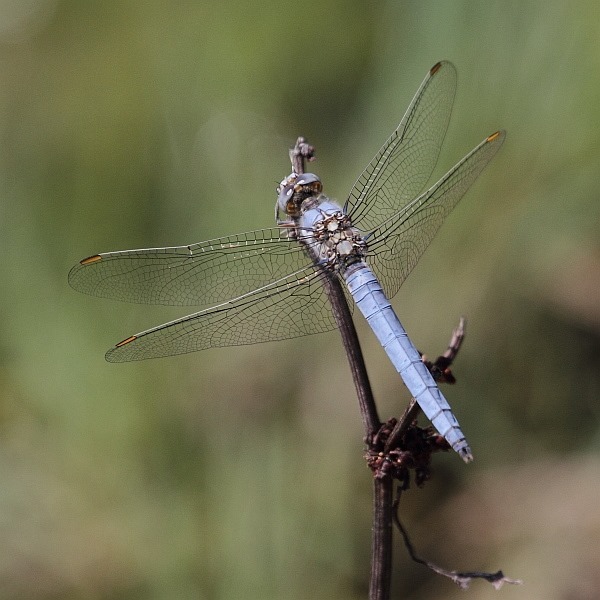 Carol managed to snap it from a distance and, though not a close shot, this is clearly an Epaulet Skimmer (Orthetrum chrysostigma). I was even more surprised. This was an interesting date: records show it flying in southern Turkey to the end of August and November in north-west Africa, though there it is suspected to be active year round [according to Dijkstra/Lewington]. I’ve added the marjal to my Spanish locations map. This is Spanish home turf. I’d first seen darters in late December here (23rd, to be precise) in 2013 and I unthinkingly assumed them to be Common Darters (Sympetrum striolatum), largely because that’s what I’m used to seeing in December, if anything. However, given my recent discovery of Desert Darters (S. sinaiticum) at the same location, I’d become uncertain as to their identity. So, I was hoping for a repeat showing with an opportunity to get a more definitive picture. I found a handful of suspects flitting about on 16th December but, once again, I was on the wrong side of the light at a poor angle and uncertain about their identification, the main possibilities being Common Darters (S. striolatum), Desert Darters (S. sinaiticum) and even Southern Darters (S. meridionale). Here’re the reasons for my confusion. This individual shows no black dots on the dorsal side of S8&9 , which I’d expect on S. striolatum. There are faint dark marks showing on the sides of S2&3 which could indicate S. sinaitcum. The thorax side appears quite plain (S. sinaiticum?) but the amount of yellow on the legs is unclear(S. meridionale?). The underside of the eye isn’t clear (S. sinaiticum vs. S. striolatum) and there even appears to be some colouration on the major wing veins (?). The jury is still out, in my mind. 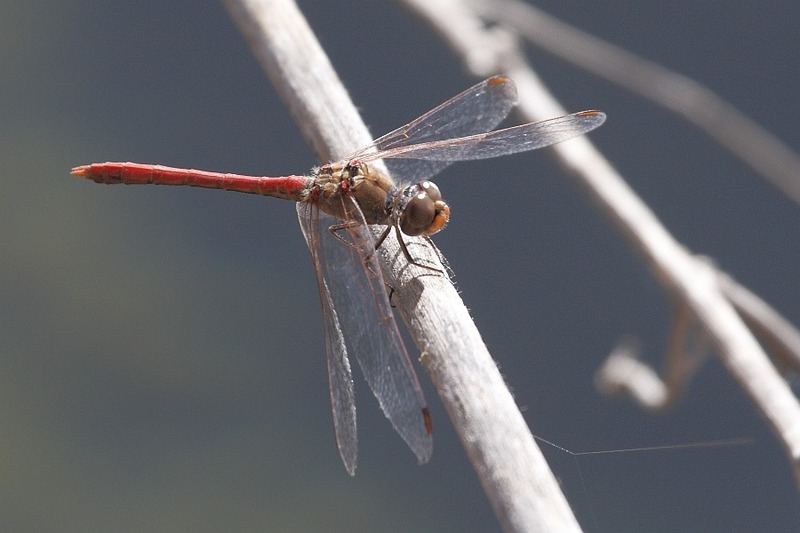 On 3rd January, 2016, to my relief and delight – this was the latest I had ever seen a dragonfly in Europe – I found a couple more red-bodied darters again. This time I managed to get a close macro shot on the correct side of the light. 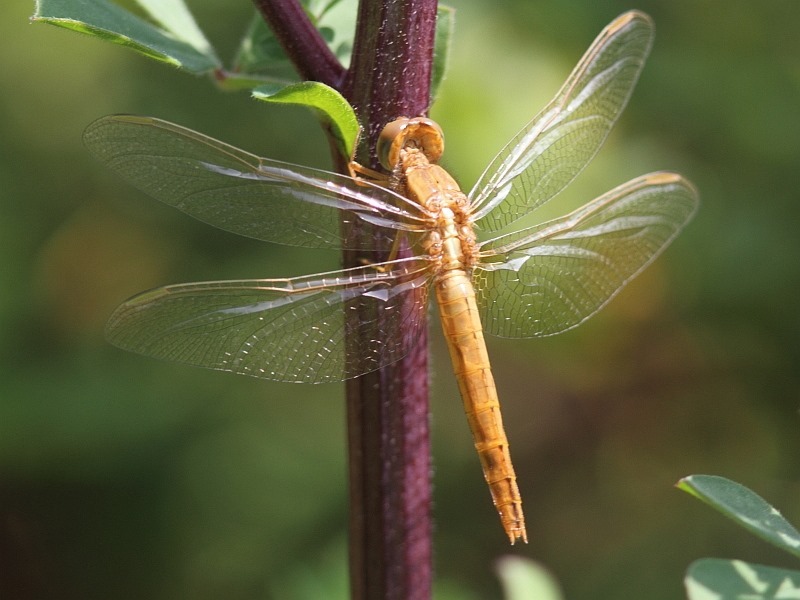 This individual does have dark marks on the dorsal side of S8&9 and a clearly brown underside to the eye – I’m comfortable that this was a Common Darter (S. striolatum). Our September trip to Spain was cut short but we returned for one week in late October, mainly for the inaugural meeting of our development’s residents committee. Oh joy! I did not go equipped with a decent Odo camera and we didn’t travel around but we did check on our local river running through Jalón once again, largely because Carol was interested in seeing the new species I’d found there in September. So, with just a single location relevant, this will be a very brief report. Brief my visit may have been but it was certainly productive. 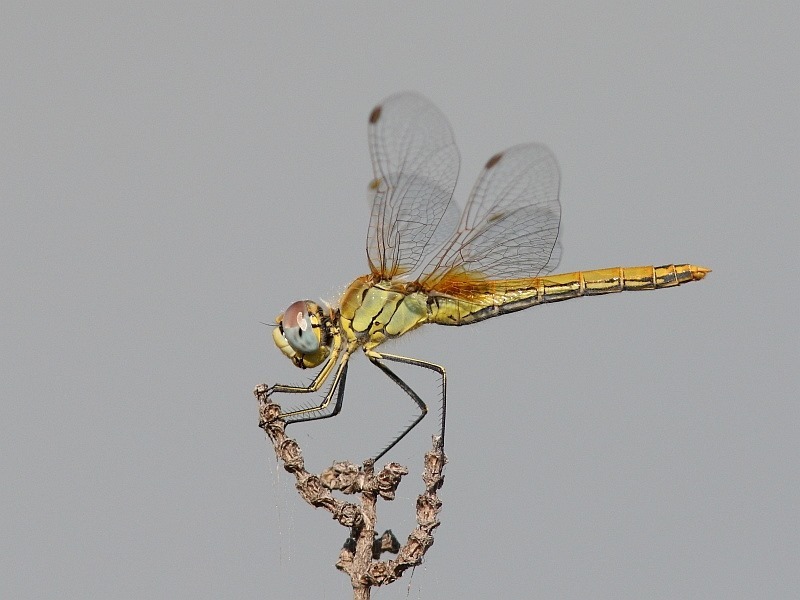 As well as again finding two of the recently discovered species from September, the Desert Darter (Sympetrum sinaiticum) and the Orange-winged Dropwing (Trithemis kirbyi), so that Carol might see them, we added two more confirmed new boys. The first of these came when we found an access point to the far side of the river which got us wandering along a reed-edged bank to a point where overlooking an otherwise hidden pool became possible. In the reeds we found one example of the Western Willow Emerald (Lestes viridis), only the second damselfly I’d seen here. Back out on the main stream, I was amazed to see what was clearly a Demoiselle, first settle and then, just as I was trying to bring Carol’s camera to bear on it, flit past and disappear. I can’t swear to it but I think I spotted a coppery colour so I’m reasonably convinced that this was a Copper Demoiselle (Calopteryx haemorrhoidalis); certainly they are in this vicinity ‘cos we’ve seen them at Les Fonts d’Algar. The lateness of the season would also favour C. haemorrhoidalis over its congeners. I returned the next day to try and find it again but, alas, it did not appear. It’s going down as a suspect, though. I have another unproven suspect to add, too. In another pool further upstream, I snapped a distant shot of a red Darter. It was an orange-red with a plain thorax side and quite yellow legs. 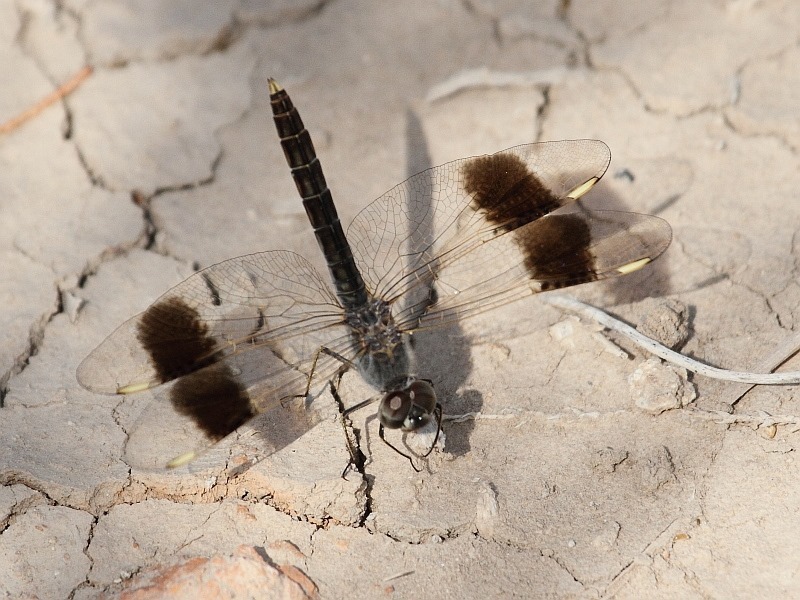 It does not display the usual dark markings on the side of S2 & 3 that are typically, though not universally seen on the Desert Darter (Sympetrum sinaiticum). 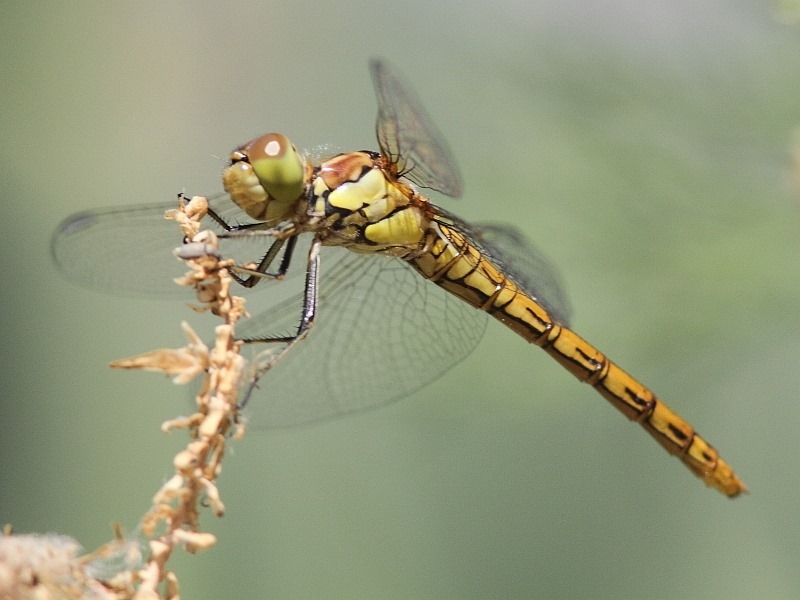 My suspicion, therefore, is that this is most likely a Southern Darter (S. meridionale). So, an interesting trip but one with a couple of frustrations. Here’s my suspected tally from this visit. 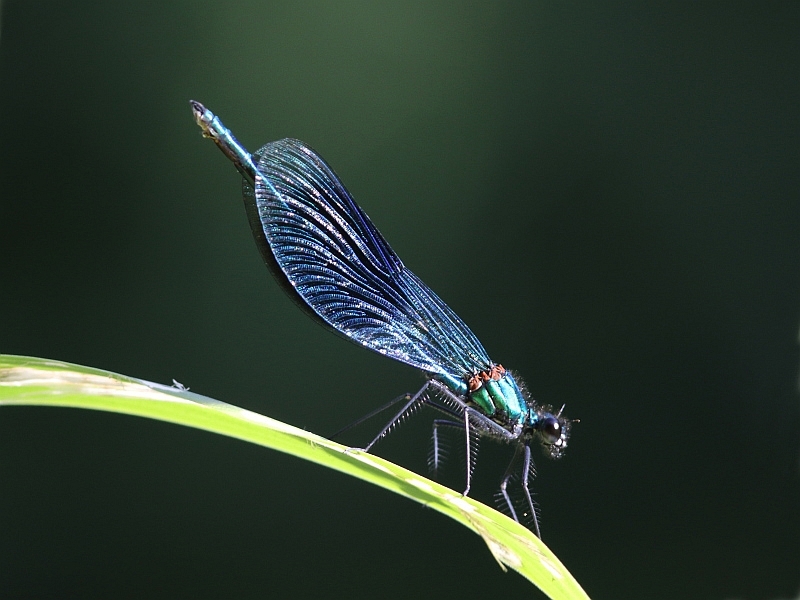 Calopteryx haemorrhoidalis (Copper Demoiselle) – ? Sympetrum meridionale (Southern Darter) – ? An autumn trip to Spain that was supposed to last five weeks was curtailed by family issues requiring an early return home. However, I did manage a couple of weeks and with some decent weather. Unusually for me, I had a target species in mind that I really wanted to see. 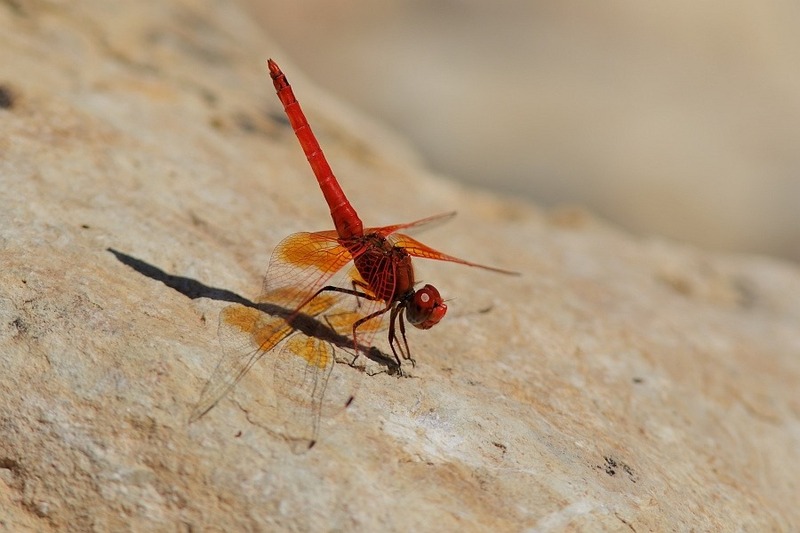 Trithemis kirbyi, the Orange-winged Dropwing, has crossed from Africa into Spain and is working its way up the Mediterranean coast quite successfully. I do not know the current northern limit of its colonization but do know that it is present in a reserve just above Valencia, the Marjal dels Moros. An internet contact kindly sent me information on accessing this reserve and I planned to try a visit as a day trip as and when the opportunity arose. As it turned out, Carol flew back to the UK after a few days and I returned by car, via Bilbao and the ferry, a week and a half after that. Since my route home would take me past Valencia, I chose to call in on the way home. Other areas I visited were some of my old haunts around Jalón itself, where I am based in Spain. Far exceeding my expectations, the local river running through Jalón was the star of this trip. Here’s a map of the numbered locations involved. There had been some rain in August with the result that the river that runs through Jalón had more water in it than I’ve seen (other than videos of famous floods, that is). Most of my experience, admittedly limited, is not so much of a river but of a series of pools remaining in an otherwise dry river bed. It really seems like more of a storm drain for the surrounding mountains, as do all the other river beds in this part of Spain. My first day’s rummage in Jalón town itself revealed good sized pools filled with clean, fresh looking water, rather than stagnant pools often covered in a good deal of scum. My first observation was of a number of male Epaulet Skimmers (Orthetrum chrysostigma) holding territory and occasionally duelling. Then I spotted a darter and began focussing on it. It looked a little unusual. My brain dared to dream. 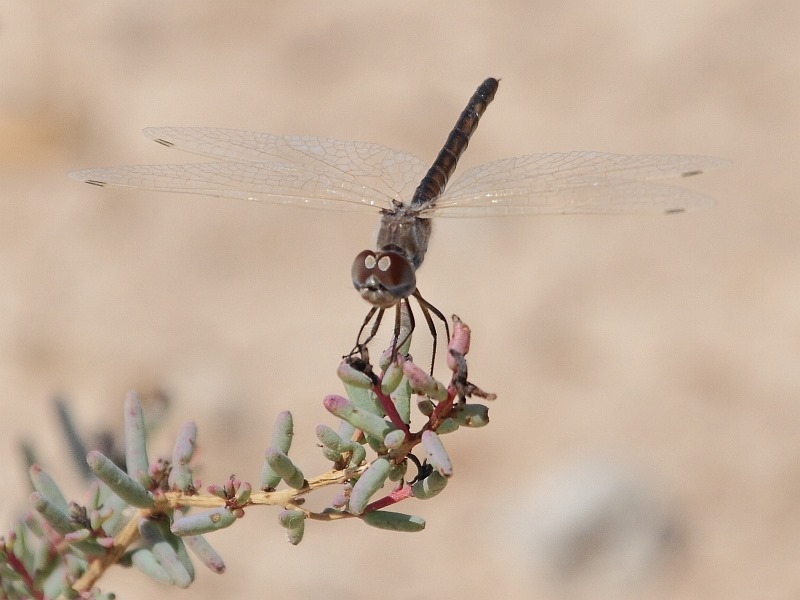 Sure enough, this proved to be my very first encounter with a Desert Darter (Sympetrum sinaiticum), which inhabits exclusively more arid regions. I was thrilled. On a second day I went upstream to another favourite pool at a bend in the river. This really was well filled with water and it was being patrolled by a few Lesser Emperors (Anax parthenope). They weren’t playing ball and posing, though. 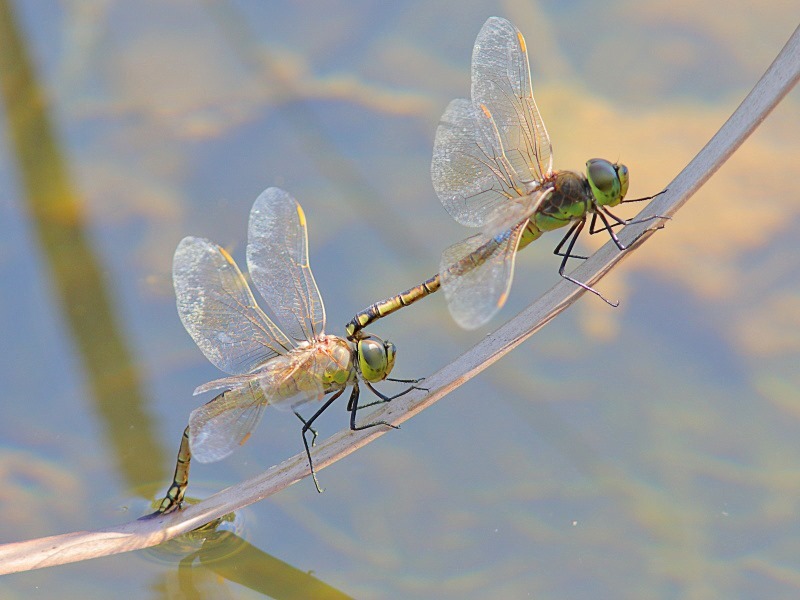 A tandem pair of what I took to be Lesser Emperors settled to oviposit in front of me. I grabbed a shot. I couldn’t believe my luck, they turned out to be the somewhat similar looking Vagrant Emperor (Anax ephippiger) [both males have “blue saddles”]. Three new species and all on my doorstep. Brilliant! About 20 minutes away from home base, this is a useful little marsh to keep an eye on – a former rice paddy, I believe. 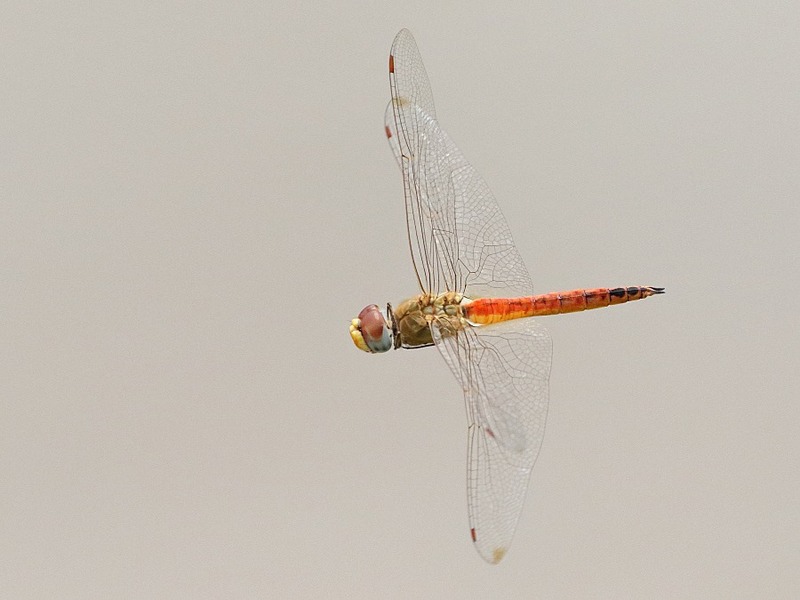 Apart from the usual large crop of Red-veined Darters (Sympetrum fonscolombii), the most intriguing sight when I arrived were several very fast, low flying dragons zooming about – so fast I simply couldn’t get a bead on them. Eventually one did settle relatively close and I realized they were Long Skimmers (Orthetrum trinacria). The males of O. trinacria develop a very dark coloured abdomen, hence their appearance. I now know they fly fast, too. This also produced my only damselfly of the trip. Being in an area where overlap occurs, this was either a Common Bluetail (Ischnura elegans) or an Iberian Bluetail (Ischnura graellsii) … or a hybrid, which apparently is possible. Another better photographed prize came a little later when,, on my way out beside the now dry water channel, I saw movement and snapped away. 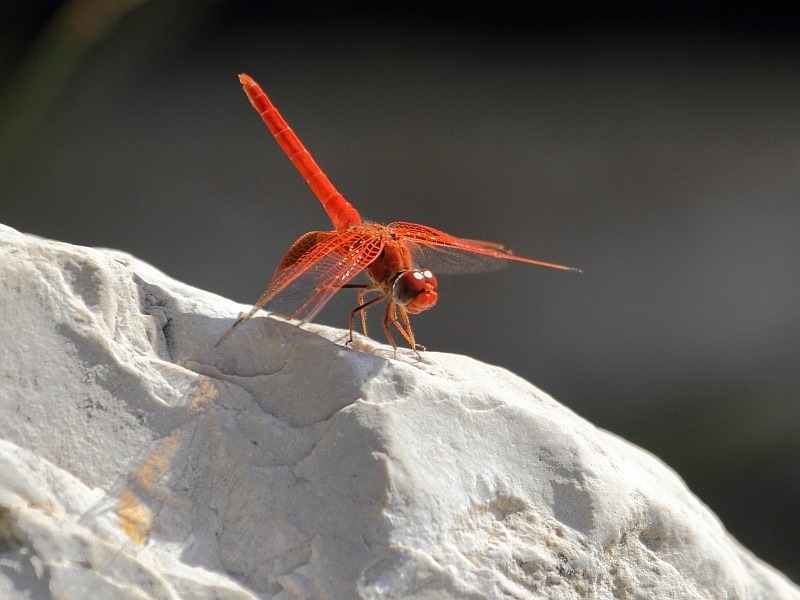 I’m very glad I did because it was a female Orange-winged Dropwing (Trithemis kirbyi) to go with my male from Jalón . There’s a clue in the name; this is an at least brackish and possibly saline lake in Calpe better known for its Greater Flamingos. I normally expect to see just Red-veined Darters (Sympetrum fonscolobii) here, being at least somewhat salt tolerant and often coastal. I’d spotted nothing on my previous visit and was a little concerned that, through a problem with the water, they may have been wiped out. I was relieved to find them back again with better water levels. 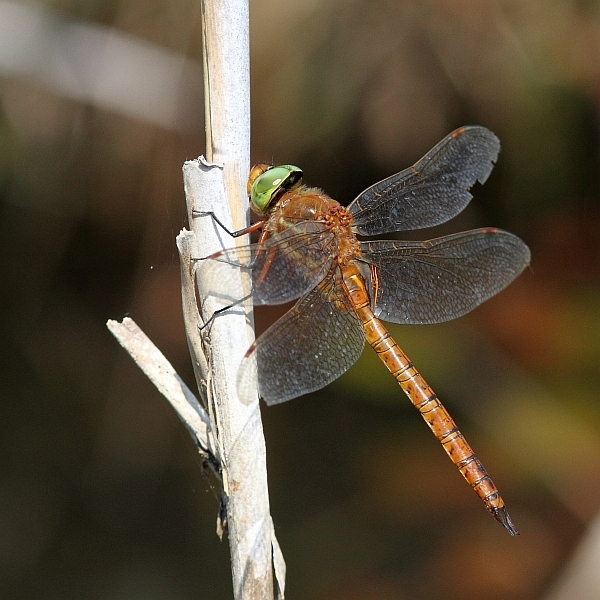 I was also surprised to see Lesser Emperors (Anax parthenope) around. I spent the afternoon here on my way back across Spain heading for the ferry at Bilbao. It is certainly the largest wildlife area I’ve yet seen in Spain but my experience is, as yet, very limited. I found navigating it quite difficult as a first time visitor, there being precious few “you are here” maps and the scale being unknown on the few that I did find. 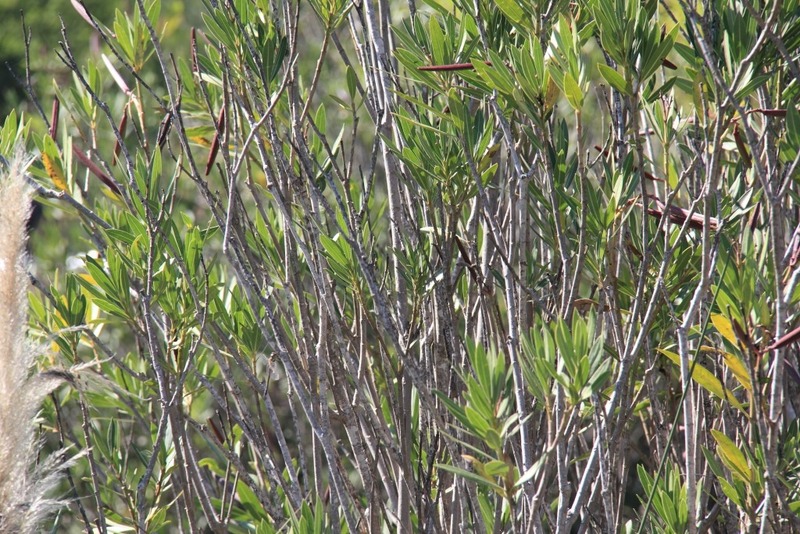 It is a coastal marshland that is clearly mainly a birding area. However, the several water bodies do attract dragonflies and apparently in quite good numbers. Whereas the birders, though, are provided with observation platforms for spotting scopes, distance not being to them a great problem, I found approaching many of these water bodies close enough to actually see the dragonflies they supported quite problematic. There were good old Red-veined Darters (Sympetrum fonscolombii) and Southern Darters (Sympetrum meridionale) in quite good numbers and eventually I did manage to spend some time snapping away at a Lesser Emperor (Anax parthenope) in flight at one pond that was beside a track and which did provide waterside access. 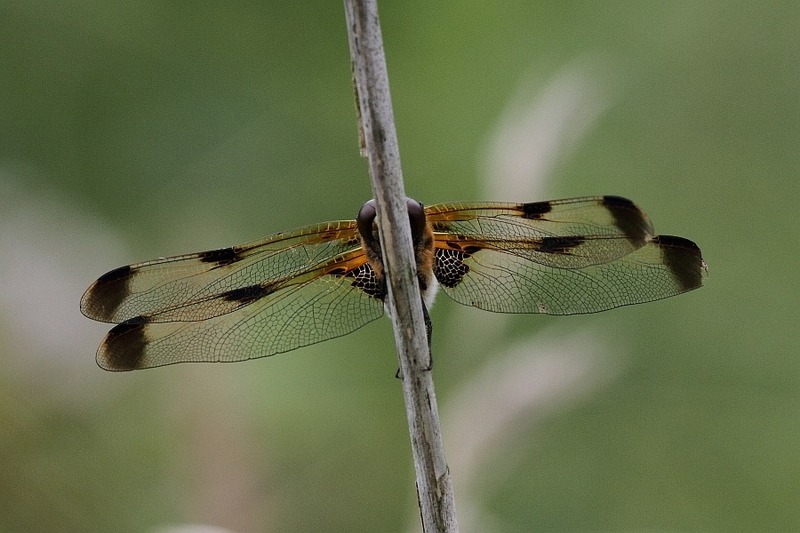 It took me some time but I eventually found what had originally been my target species and my main reason for visiting this marsh, the Orange-winged Dropwing (Trithemis kirbyi). Photographically, though, my Spanish home territory of Jalón had it beaten hands down and I confess to remaining a little underwhelmed. I’m sure,though, that had I not already seen my quarry, I’d have been a lot more positive about it. I must confess that after a couple of hours walking my main concern was finding my way back out of the marsh and back to my car. Still, worth a visit en route. 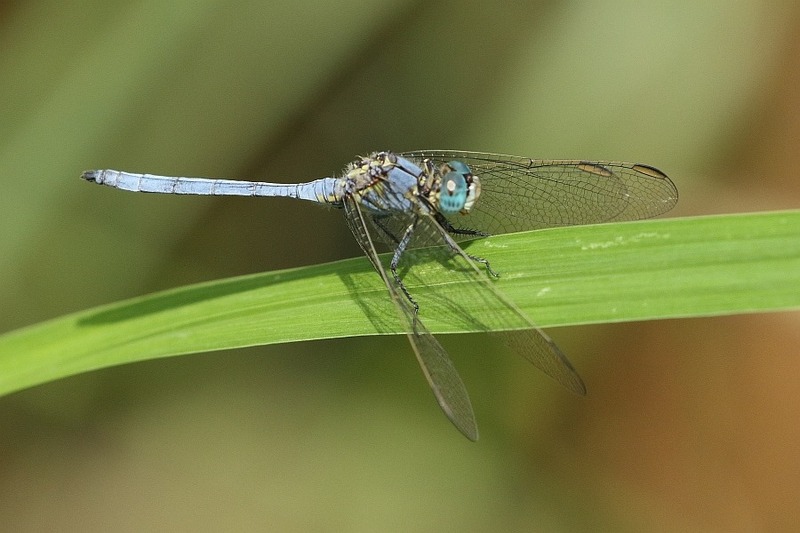 Anax ephippiger (Vagrant Emperor) ? Having recently returned from France with a 2-week side trip to Spain, My boss today headed back to Spain along with her mum. Sister was supposed to go, too, but that’s another story. I did the airport run dropping my passengers at 5:30 AM for their 7:30 AM flight to Alicante. They’re gone for a week. I did not plan to stay at home twiddling my thumbs and doing chores while everyone else was off enjoying themselves in the Spanish sun. Norfolk was beckoning. I decided to travel up on Wednesday 8/07/2015 and stay through Saturday 11/07/2015. My preferred Caravan Club site at Ludham was regrettably fully booked but I found what looked like a reasonable alternative on the southern edge of Norwich run by the Camping and Caravanning Club. It is described as a city site with a country feel. This site did have space so I booked in. I left the house at almost 11:00 AM with a bag of clothes and headed off to collect my caravan. We sailed up the now completed A11 – there were nightmare road works last year – and arrived at Norwich a smidge before 2:00 PM. At last the road into Norfolk is reasonable. The A47 south of Norwich is still a mess but fortunately I dived off the A47 at the previous exit to get to my campsite. Being less far into The Broads, I actually had a specific goal in mind. 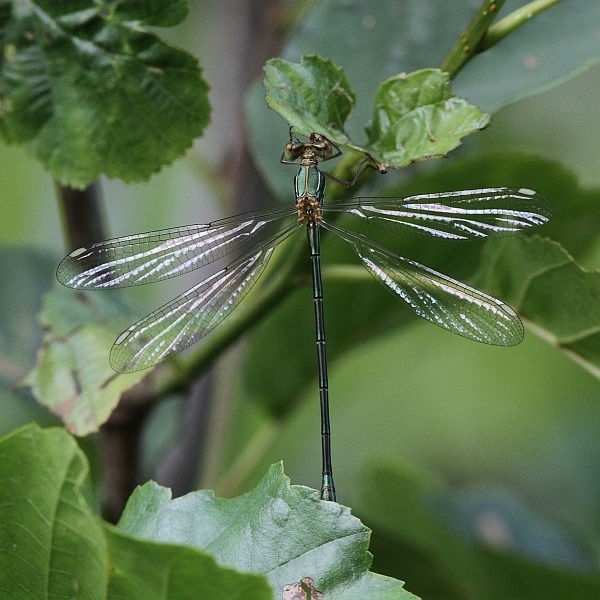 I would be considerably closer to a site that I’ve wanted to visit for some time, Thompson Common, which is home to a healthy colony of Scare Emerald Damselflies/Robust Spreadwings (Lestes dryas). I’d seen a suspect in France but never one in the UK. With a good forecast for the coming three days, I was hopeful. Right beside the campsite is a delightful stretch of the River Yare complete with duckweed, grasses waving underwater in the current, reeds and trees lining the banks. It’s really quite captivating, all the more so because it was absolutely teeming with fluttering Banded Demoiselles (Calopteryx splendens). If these so-called riverside butterflies don’t charm your socks off, nothing will and you are a completely lost cause. The forecast for the next few days was quite good so my hopes were high. Alderfen is a Norfolk Wildlife Trust reserve. Since being introduced to it by the Norfolk dragonfly recorder and former president of the BDS, I have visited twice, once with Carol on our rediscovery of Norfolk trip and once by myself on my previous solo trip late in the season. 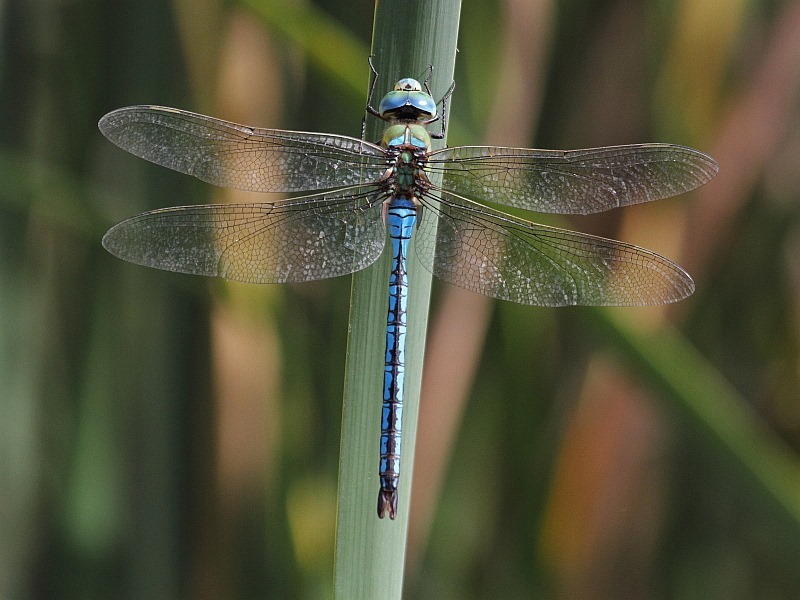 It’s an enchanting place, teeming with Odonata and not with people, being well off the beaten track and, perhaps a lot less well known that places like Upton Fen and Strumpshaw Fen, whose reputations precede them. Alderfen is very much my kind of place: very quiet. The Thursday weather was looking good but perhaps not stunning, so I chose to complete my journey into Broadland and return to Alderfen. This time Alderfen proved to be busy … by Alderfen standards, that is; there was another car in the miniscule car park when I arrived, for Darwin’s sake. Did they have permission? I never did see the car’s owner but, as I started along the circular track, another lady turned up and began minutely examining grasses using a hand lens. Towards the end of my circuit, I bumped into a couple of walkers who turned out to be locals, living on the doorstep. I think I may have seen one other person on earlier visits but at Alderfen three other people constitutes a crowd. It’s unheard of. I completed my circuit in about two hours and clocked up 13 species. The most surprising thing was that six of them were new to me at Alderfen taking my personal species count here to a very impressive 19. That’s just two less than occur in the whole of my home county. There were two very interesting individual suspects that I saw. My second surprise was seeing a very teneral Emerald Damselfly/Spreadwing of one description or another flutter up and hang-up. Unfortunately, it chose to perch with the very tip of its abdomen hidden behind foliage so I couldn’t see the potentially diagnostic appendages clearly – well, not at all, never mind clearly. I managed a shot but after it had flown off, as they inevitably do, having begun by thinking Common Spreadwing (Lestes sponsa) or Robust Spreadwing (Lestes dryas), I realized that this could have been a Western Willow Spreadwing (Chalcolestes viridis). This formerly continental species first made landfall in Suffolk near Ipswich some years ago, established a foothold and has been spreading out from there ever since. It is now quite common in Norfolk. I hadn’t got a side shot of the abdomen for its diagnostic “spur” but, looking at the pterostigmas, that last is indeed what I think I saw. 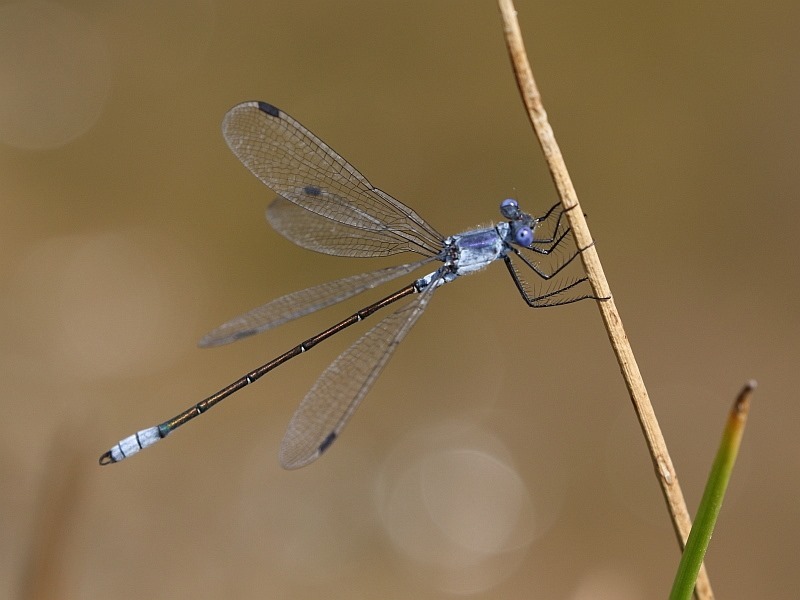 [I have since asked for opinions and have received agreement on Western Willow Spreadwing.] I’m familiar with this species in France but this was my first encounter in the UK. Happy camper. Oh, if you’re very lucky at Alderfen, you may catch a glimpse of an otter. I heard one go in after fish but I didn’t see it. The fish were scattering, though. And so to what I was hoping would be my main event for this trip. The weather forecast for the day was excellent so this was the time to hit pastures new. The pastures I was heading for were the so-called pingos on the Pingo Trail at Thompson Common. This is reportedly home to a healthy colony of Robust Spreadwings/Scarce Emerald Damselflies (Lestes dryas) which I have never seen in this country. I have a French suspect but it is just that, a suspect. My target was 25 miles back down the A11. After a leisurely morning, I set off. This was my major goal achieved but there were another two pingos close by. I spent some time combing those to see what I could find. In the end I spent a couple of hours and came up with the following 11 species for my introductory day. I was tempted to return the following day to investigate ground a little further along the trail. I mentally flipped a coin to decide where to go today. My mental coin-flipping result was partially influenced by the weather forecast which was for a clear, sunny morning with cloud building up in the afternoon. Therefore, I didn’t want to waste too much time travelling and miss the good weather. A return trip to Thompson Common walking further along the pingo trail this time would have been interesting but it’s 25 miles away and, let’s face it, new pastures are always more interesting. The RSPB reserve at Strumpshaw Fen was a mere 9 mile away so I opted for that. I timed my arrival for 11:00 AM; that should’ve given the Odos time to warm up. There are three circular walks at Strumpshaw but the one featuring the most Odo activity seems to be the Meadow Walk. I was interested to see several small family groups of people at an RSPB reserve who seemed to be more interested in Odos than in Aves. Yeah, we’re taking over! If I had a main interest here, I suppose it would have to be the Green-eyed Hawker a.k.a. 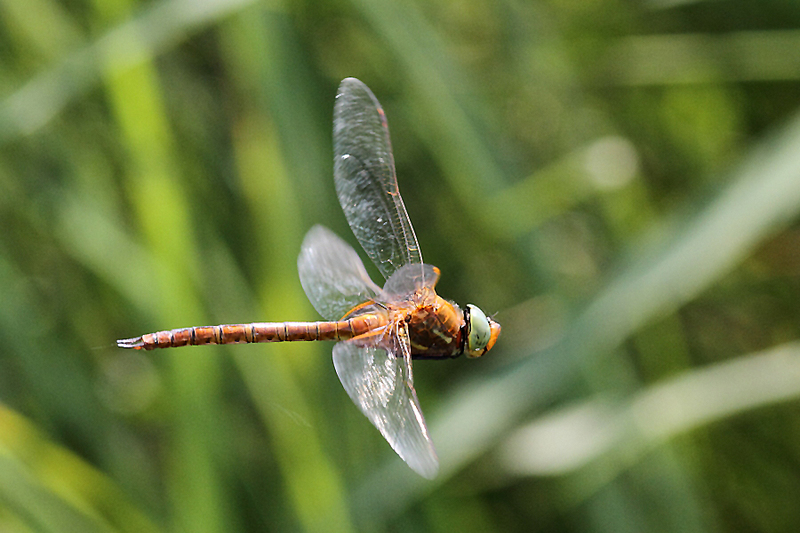 Norfolk Hawker (Aeshna isoceles), just because it is unusual to me and, of course, because of its local celebrity status. I wasn’t disappointed. A stream marking one edge of the Meadow Trail produced several. The first one I spotted was being constantly harried by Four-spotted Chasers, making photography difficult. However, a few more a little further along were being left more to their own devices and pictures became possible. A. isoceles seems to perch/hang up more than most Hawkers so it isn’t too difficult to get a picture, given a little patience. Once you’ve got something static in the camera bag, you might try an in-flight shot. I learned of La Tourbière des Dauges a few years ago from an internet acquaintance also keen on Odos, one Nick Ransdale of Moulismes Nature. A few years ago we visited another tourbières [peat digging], Les Tourbières de Vendoire, and as well as having a very reasonably priced rural campsite literally right on its doorstep, it produced 22 species of Odos in a day. My interest was piqued so we decided to pause on our northward journey home in the last week of our 2015 French trip for a visit to La Tourbière des Dauges. La Tourbière des Dauges lies slightly to the northwest of Limoges. To our eyes, the most appealing campsite of a restricted selection was what looked like being an overpriced Les Castels site just north of Limoges called Camping Chateau de Leychoisier. This is where we chose to stay for a princely €35 a night, though being July we were into high season and it may not be regarded as quite so over-priced if you plan to use its many facilities (pool, restaurant, bar etc). What we generally want is a simple field with shade and electricity. We were assisted in finding the precise location of the reserve by road signs beginning very close to our campsite. Follow those and you’ll end up in the tiny village of Sauvagnac close to the reserve’s entrance. There is a car park (“P” on the map) but it is very small, about seven cars, but small village roads are not impossible. A helpful lady in la maison de la résèrve pointed us to a short (1km) and a long (5kms) walk that would get us to a few dragonfly spots. What I had not realised prior to our visit was that the main attraction from an Odo-nutters viewpoint is the presence of Northern Emerald (Somatochlora arctica). We began with the short walk before tackling the longer one and the firs suspect we saw was, indeed, S. arctica. Unfortunately, it wasn’t about to settle, flying a circuit seemingly tirelessly. The short walk produced several more S. arctica encounters, none of whom settled. The longer walk again produced more encounters with S. arctica, all on the wing. I failed to get a picture to celebrate my new species. 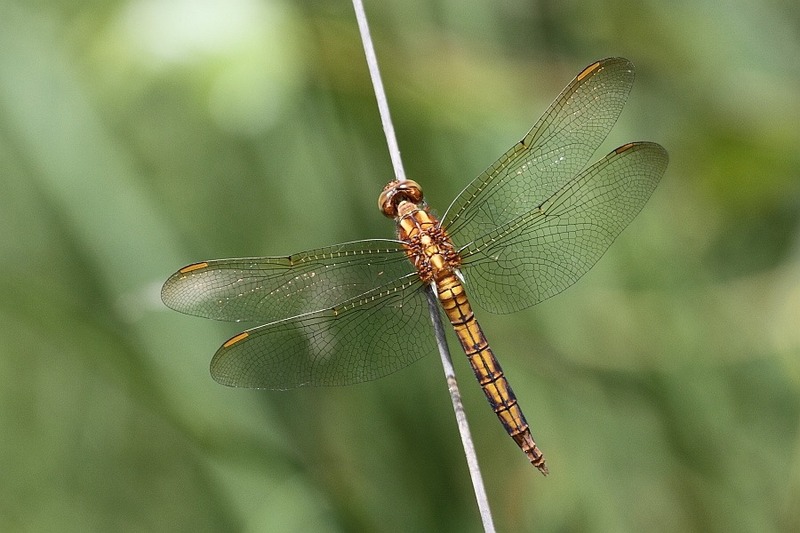 🙁 Keeled Skimmers (Orthetrum coerulescens) were also numerous but I regarded our most successful photographic encounter to be a Common Goldenring (Cordulegaster boltonii) which settled on one of the access tracks. This seemed like a pretty meagre haul to me. If it weren’t for the sight of those Northern Emeralds, I would have regarded it as almost pointless. However, a new species that requires a very specific type of habitat is always exciting. WARNING: Our most worrying insect haul was of those infernal ticks, no fewer than seven of which found their way onto Carol and most of which attached themselves. The walks take you through some very marshy areas and they get through open-toed shoes. I urge anyone visiting this site to wear Wellington boots as protection.